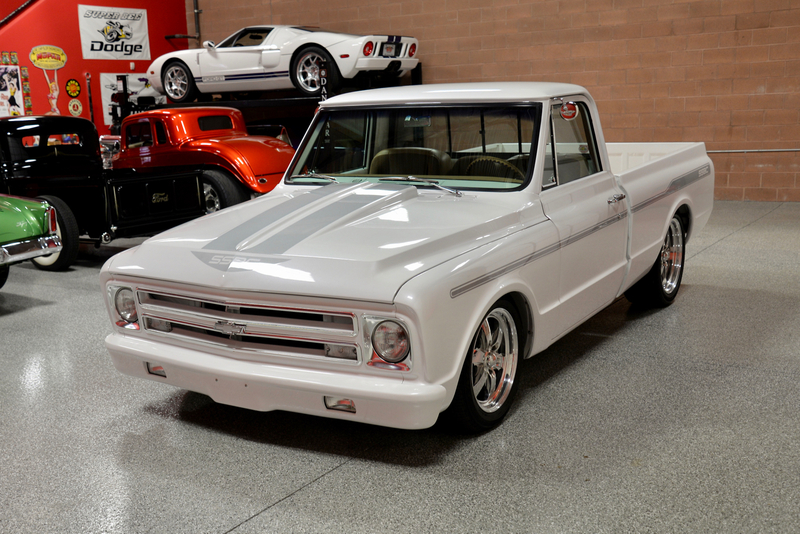 ‘Red Hills Rods & Classics’ is proud to offer you this absolutely stunning 1970 Chevrolet C10 Custom Pickup, built by Mike Jonas, owner of the Stainless Steel Brake Company (SBBC). 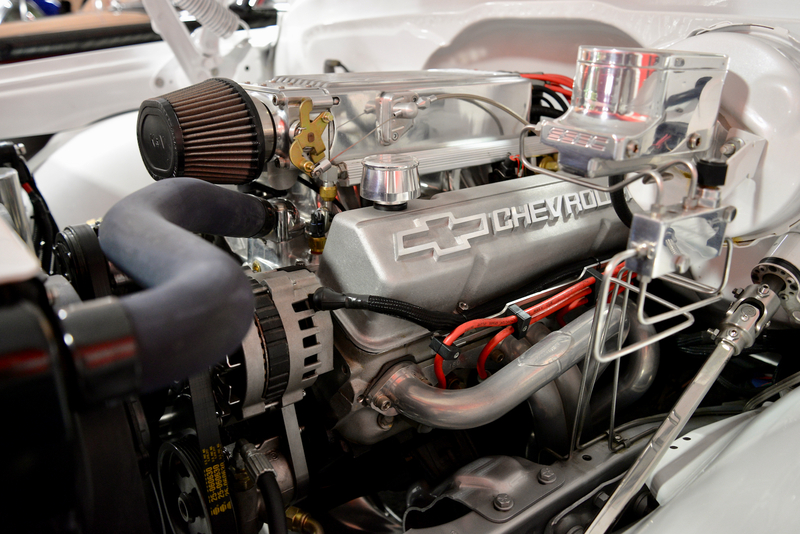 Featured @ SEMA in 2015 to promote the outstanding products offered by SBBC, SEMA awarded SBBC w/ the GM Design Award, and has recognized how special their products are. 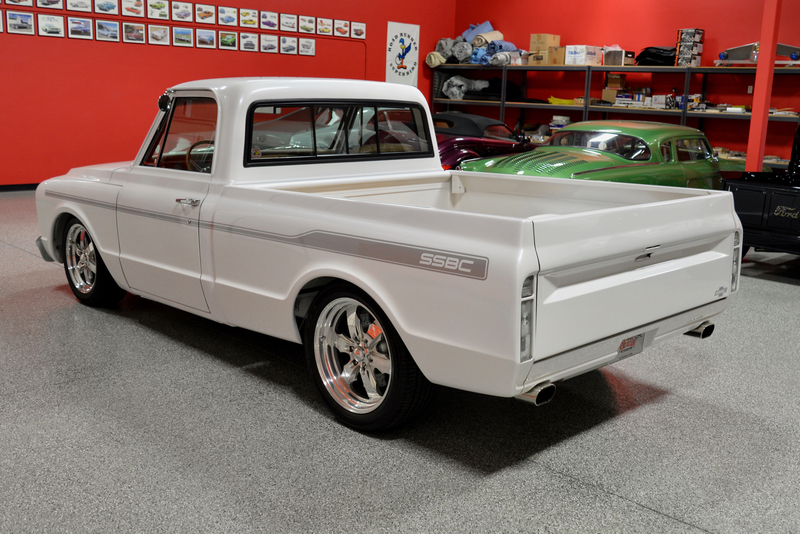 Had Don Yenko survived, he probably would be smiling after seeing how Mike Jonas came up with his Yenko-inspired 1970 Chevy C10 Pickup. 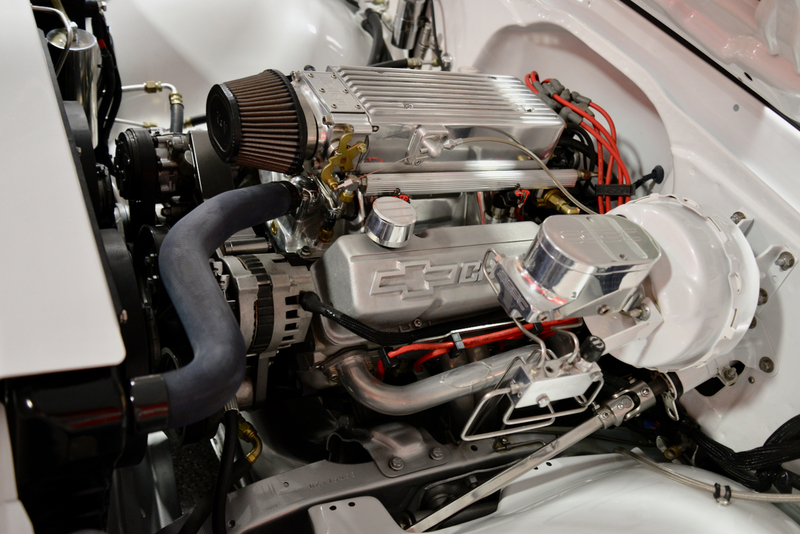 In the course of promoting his company & its products, Mike decided that he wanted to put together a show piece, a vehicular attraction that would not only impress Hot Rodders & motor-heads alike, but would also act as a moving display of his top-of-the-line products. 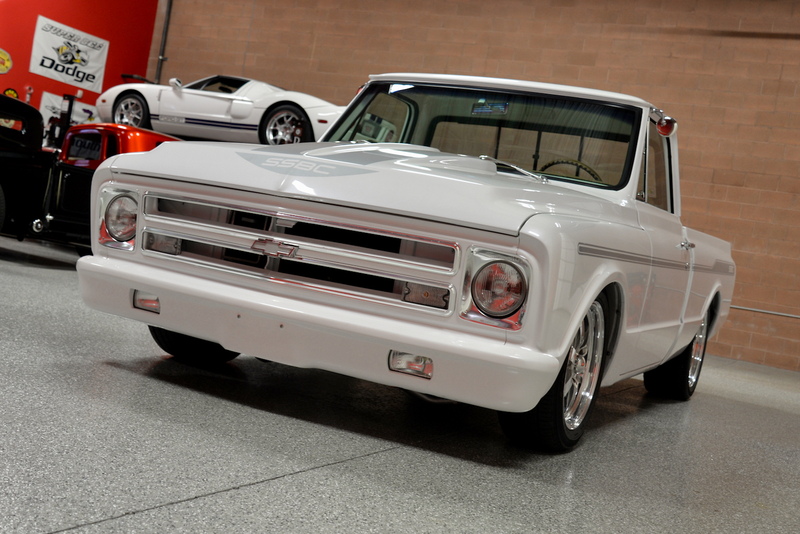 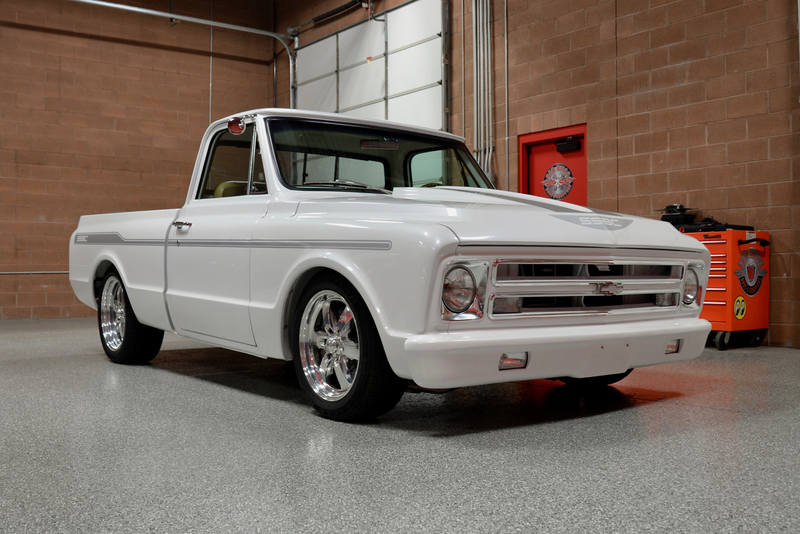 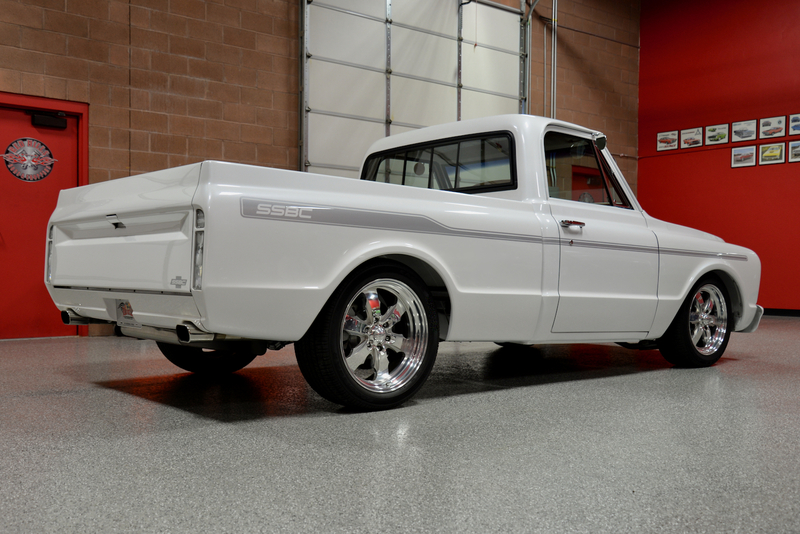 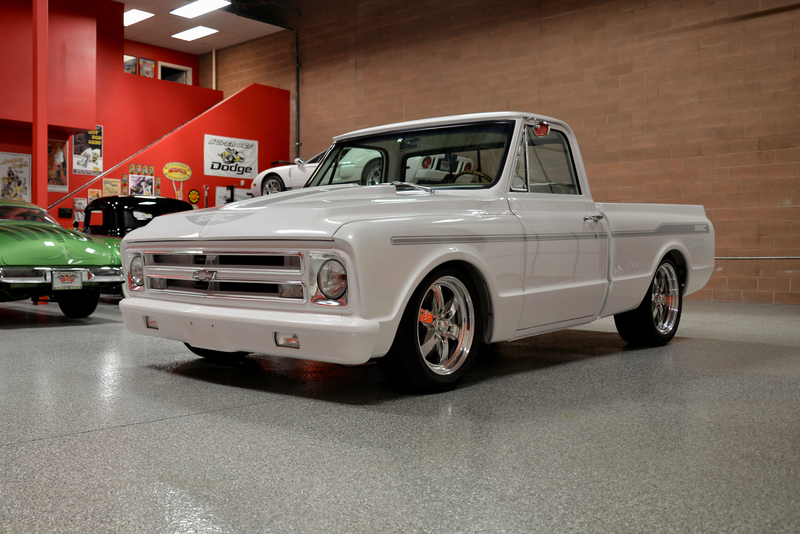 Mike has built a variety of Hot Rods & muscle cars over the years, but had never built a truck, so the decision was made to build a one-of-a-kind show-stopping pickup loaded w/ an assortment of go-fast goodies, modern flair, and of course, one hell of a brake system! 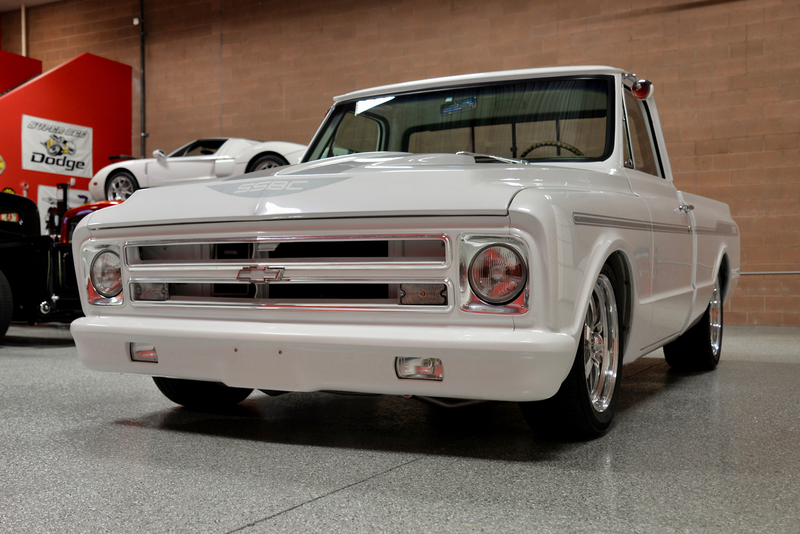 He was fond of the late 60s & early 70s Chevy C10’s, and decided that this model would be his next project. 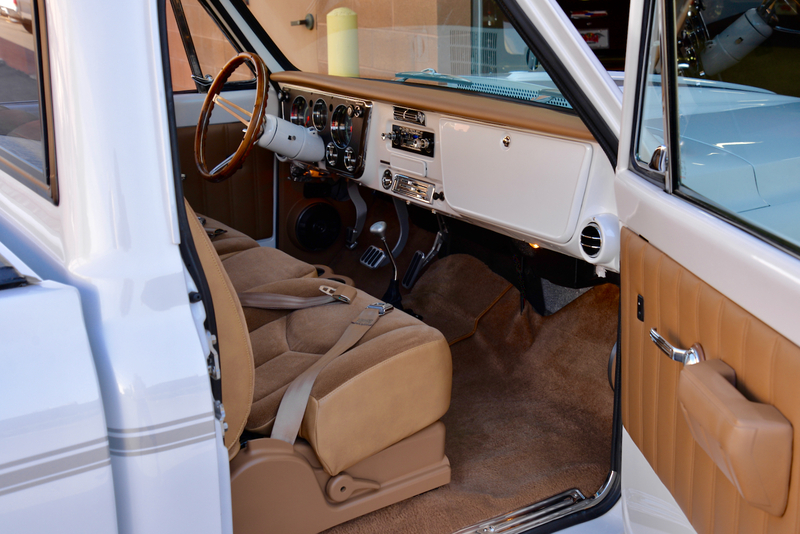 He located a rust-free 1970 C10 sitting out in a dry field sixty miles east of Los Angeles, and bought the truck sight unseen for $1,500. 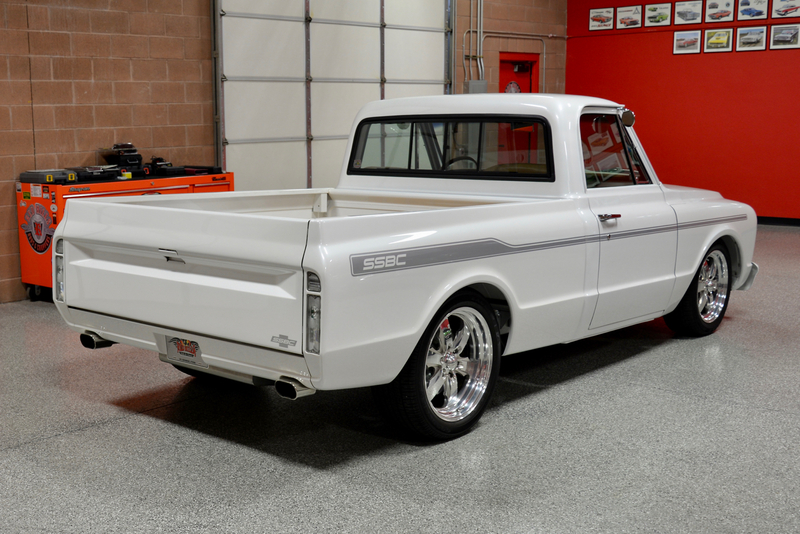 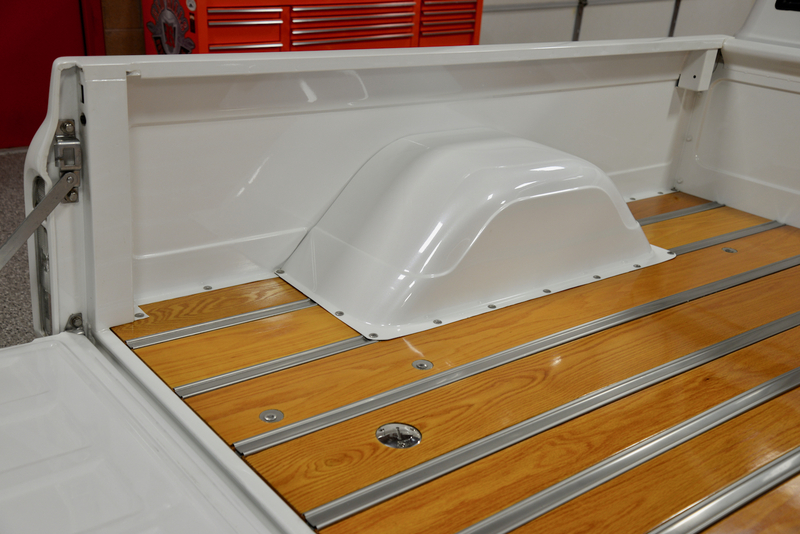 In a past life, the vehicle served as a landscaper’s truck in California, and had rolled from the factory as a wood-bed ½ ton, the perfect back-story for Mike’s build. 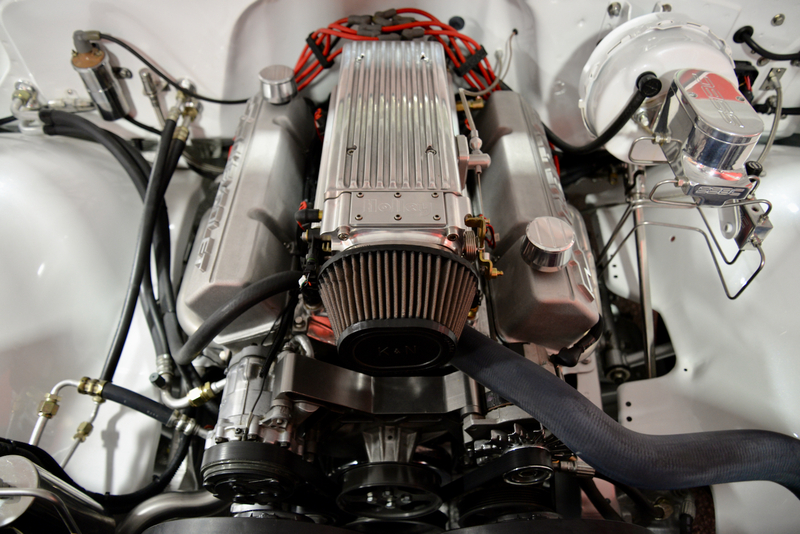 He immediately had it shipped back to his home in the ‘rust belt’ of upstate New York, and the no expense spared project began. 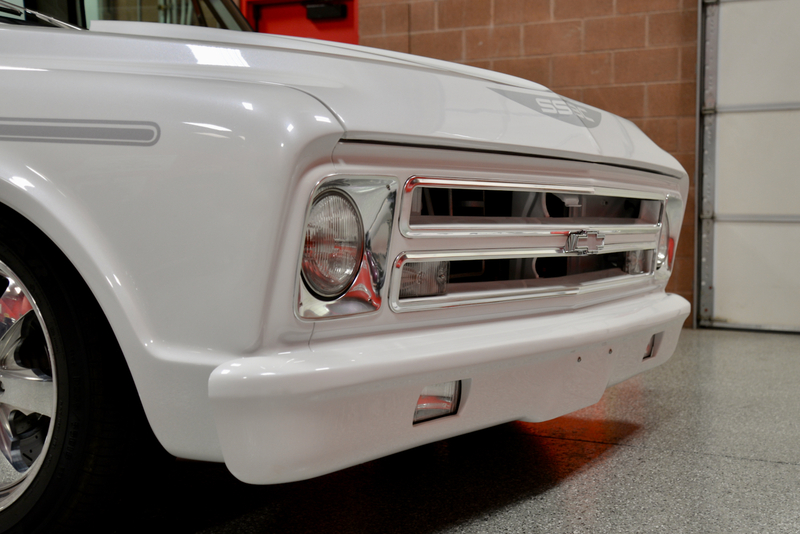 The exterior was a collaboration of sorts, and while Mike had some of his own ideas for the truck’s overall look, he turned to the crew at Aero Collision in Lancaster, New York. 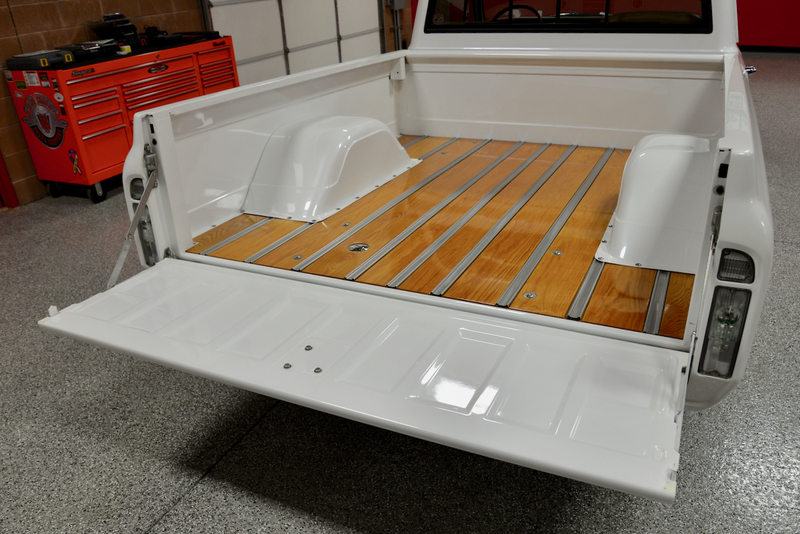 The bed was a little rough, but amazingly the cab was nearly perfect w/ just a haze of surface rust. 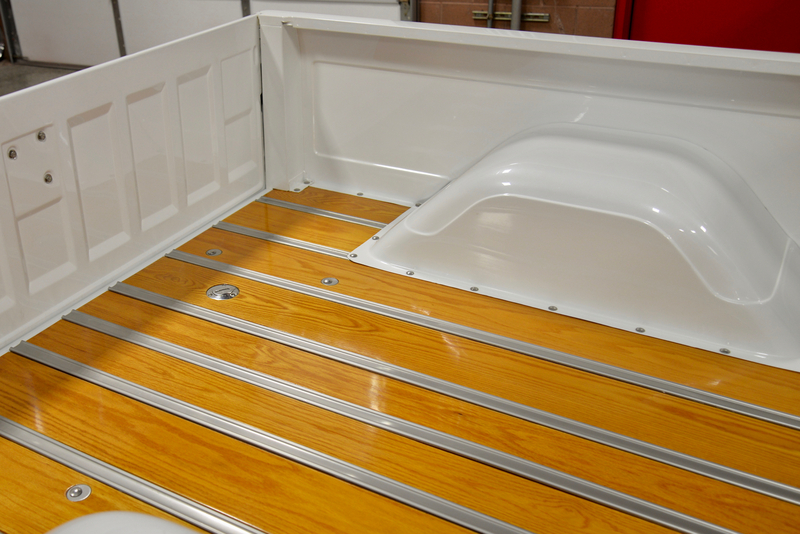 Mike and his crew tore the entire truck down in eight hours w/ a set of 3⁄8 wrenches and a little muscle. 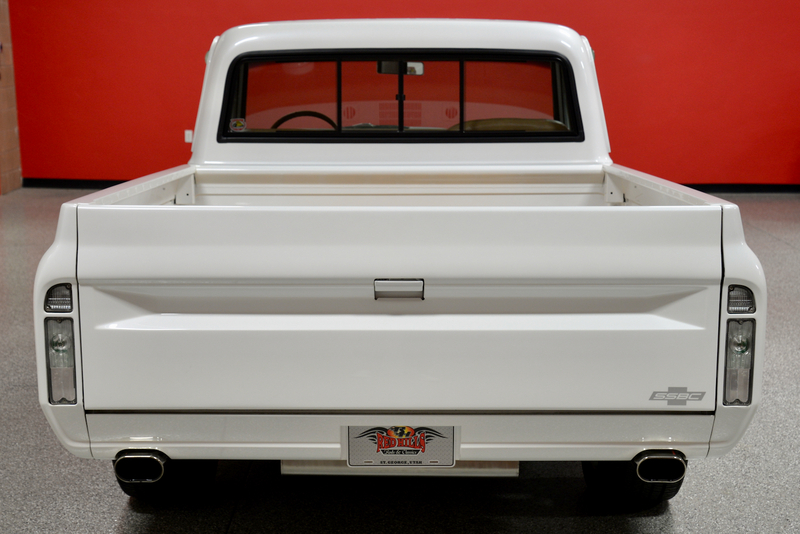 It was then sent out to the blaster for a through cleanup, while the cab, tailgate, & frame were saved for the new build. 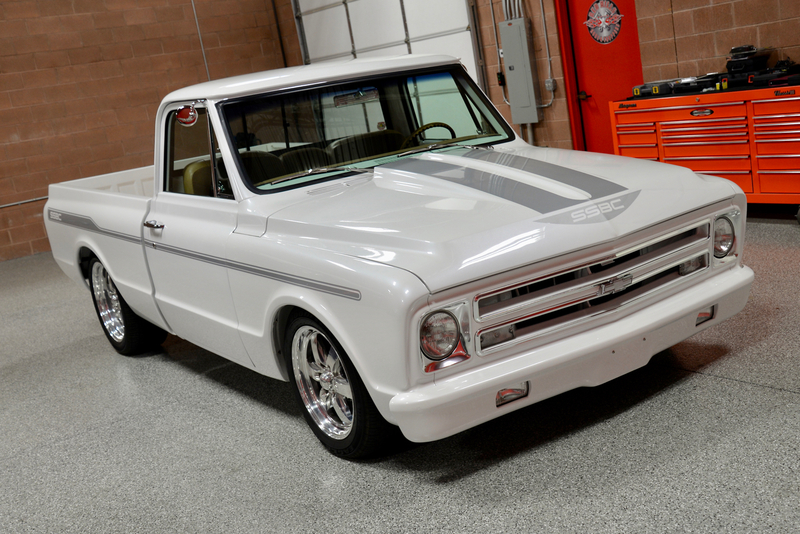 A new front clip was ordered from Dynacorn, they reworked the hood into beautiful custom cowl design, while the 8’ bed was shortened to 6’ to give the ride a stouter, more powerful appearance. 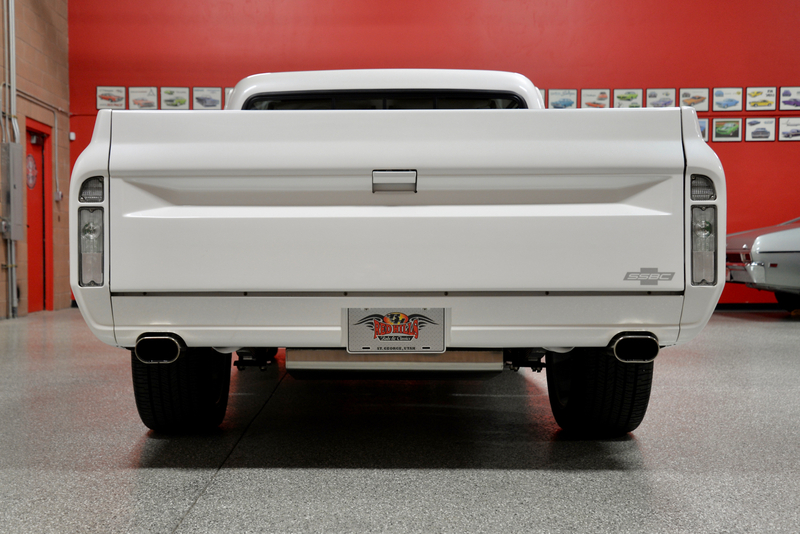 Markers & taillights are off of a 1967 Blazer which look awesome, and the good people at Dakota Digital supplied the cool LED taillight system. 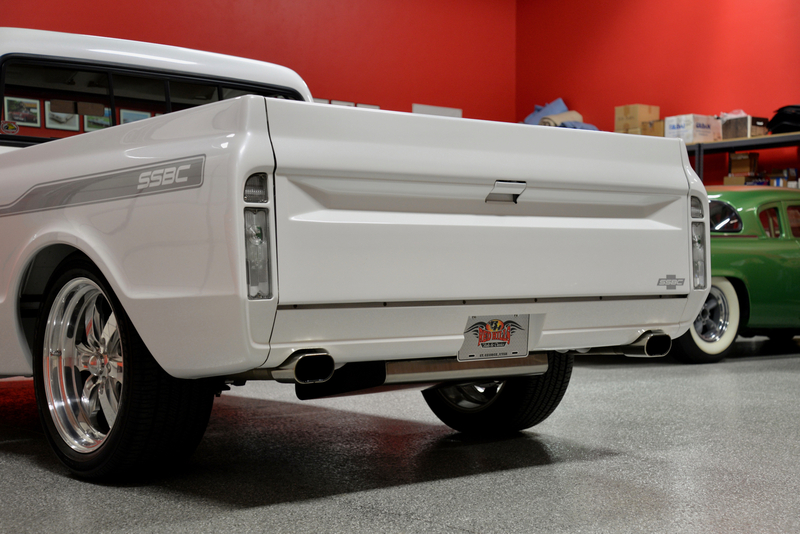 Mike always loved the look of these pieces and they look right at home on this pickup. 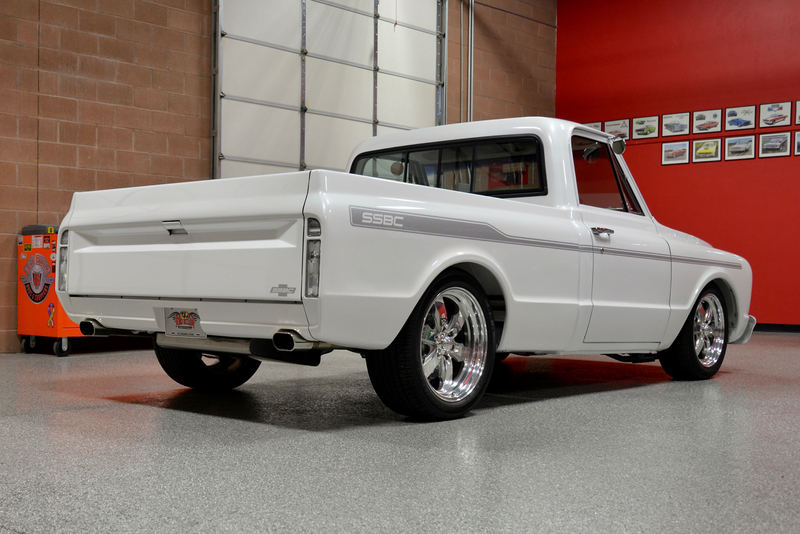 Back wheel-tubs were doubled and Aero Collision handled all the fabrication work, prepping the body for a dose of Sherwin Williams Standard White w/ lots of Silver Metallic added to the mix. 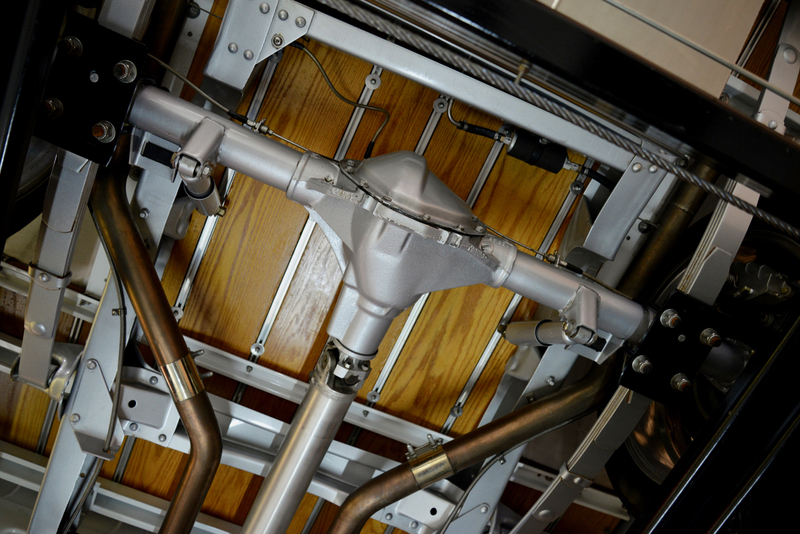 Getting the right color became a process, which started with a Silver paint that Sherwin Williams supplied for the frame. 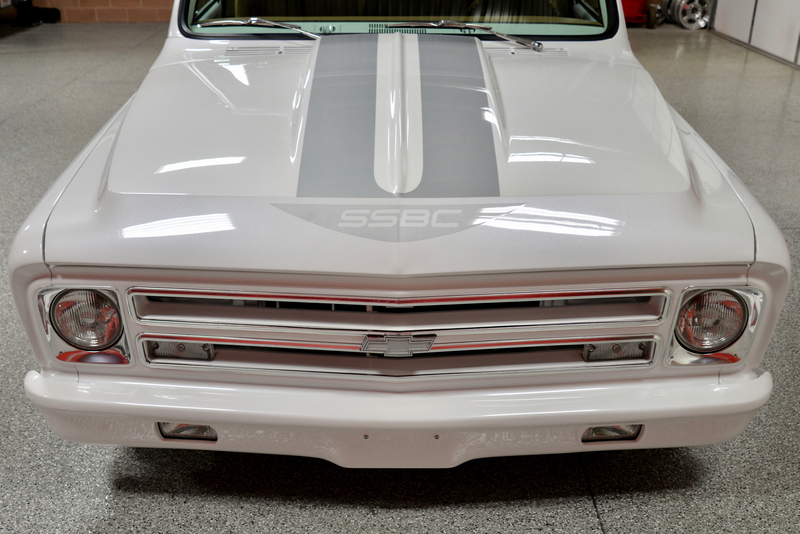 They primed the body w/ the Silver, and then applied a Bright White w/ pearl. 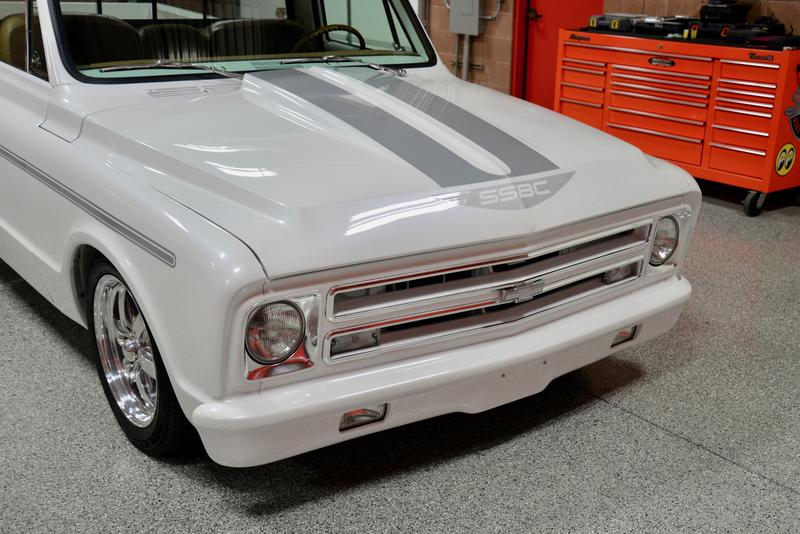 After the exterior paint was completed, the Silver was applied through a razor-cut stencil for all the accents then the clear-coat was applied. 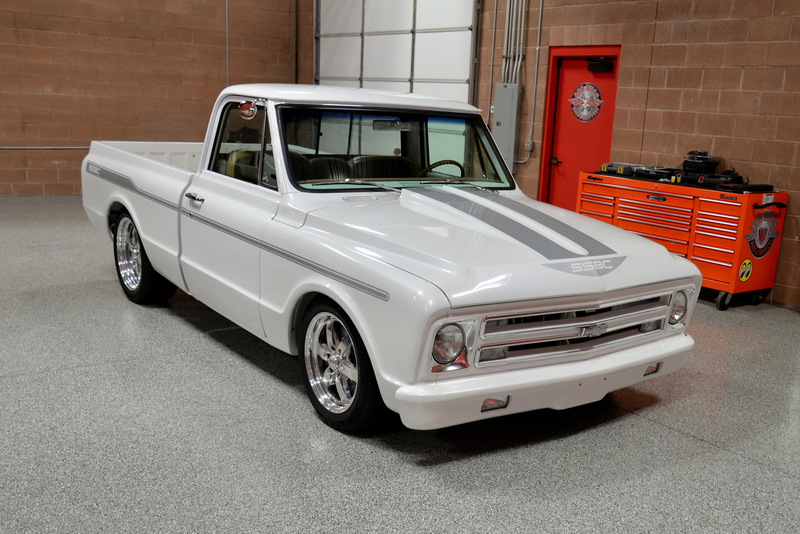 The result is really absolutely striking to say the least! 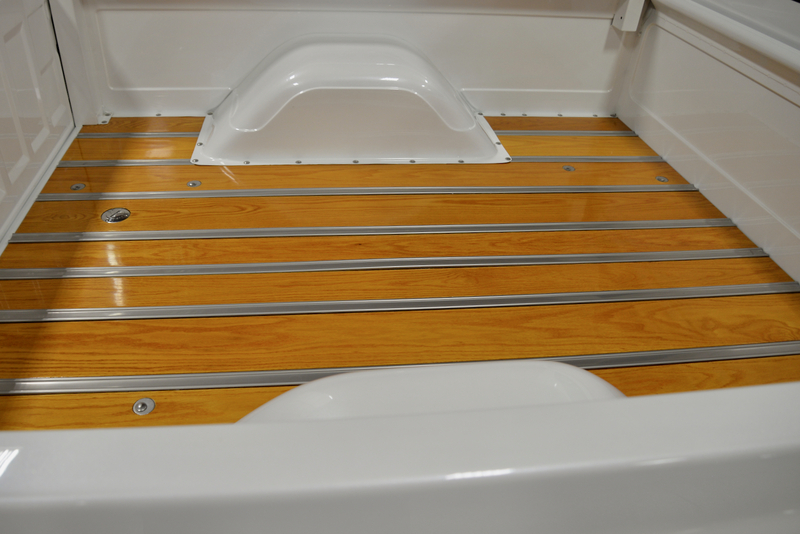 Out back, Bed Wood supplied the beautiful white oak to which Mike added 14 coats of varnish, then buffed it to a brilliant shine. 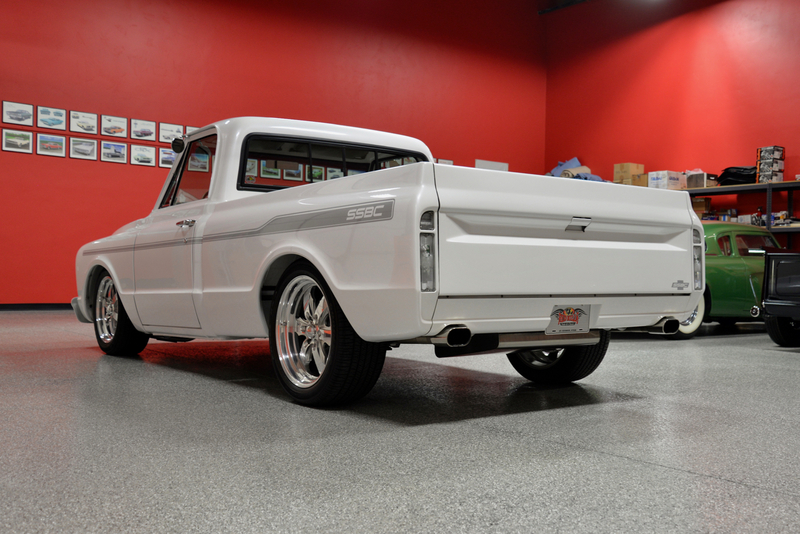 While this was going on, the frame was C-notched for a lowered stance and then completely painted in Sherman Williams Silver. 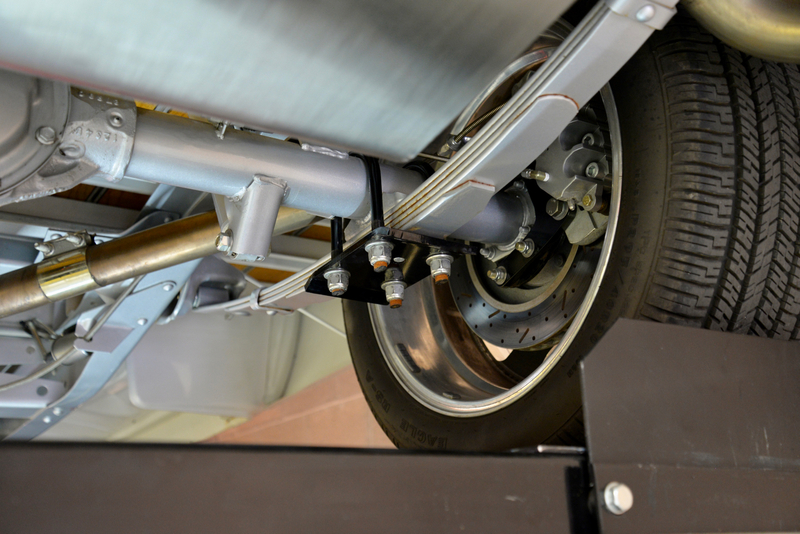 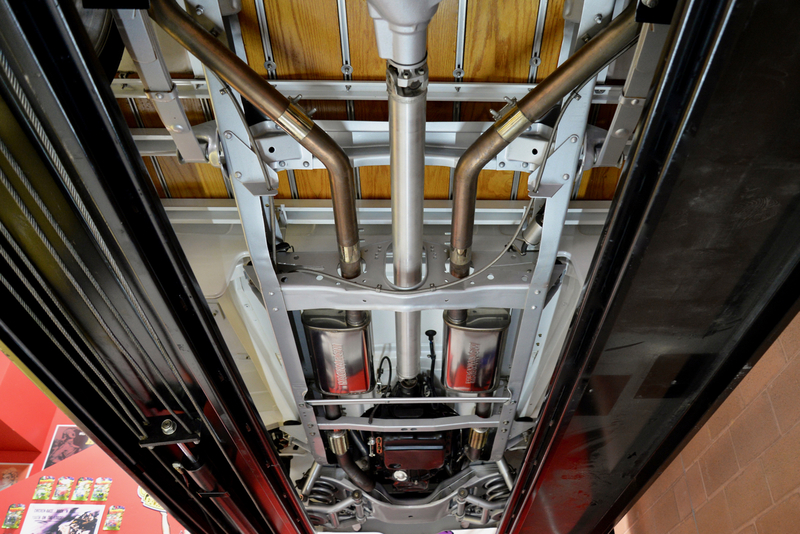 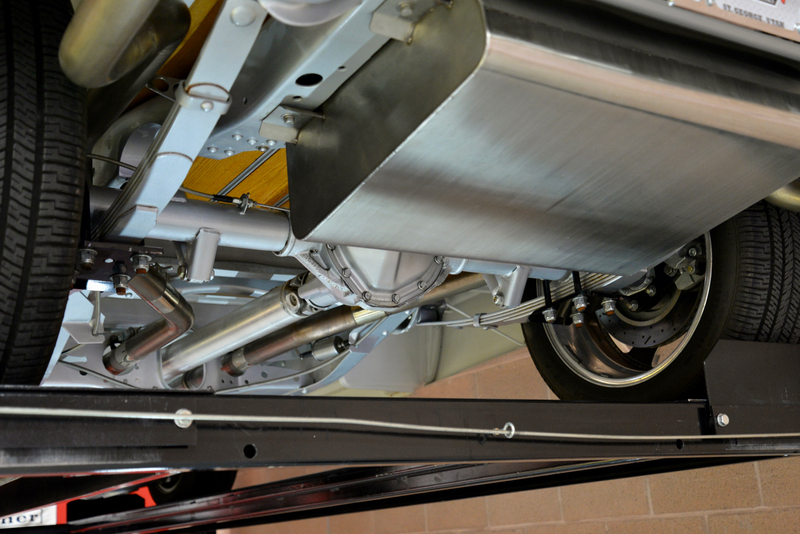 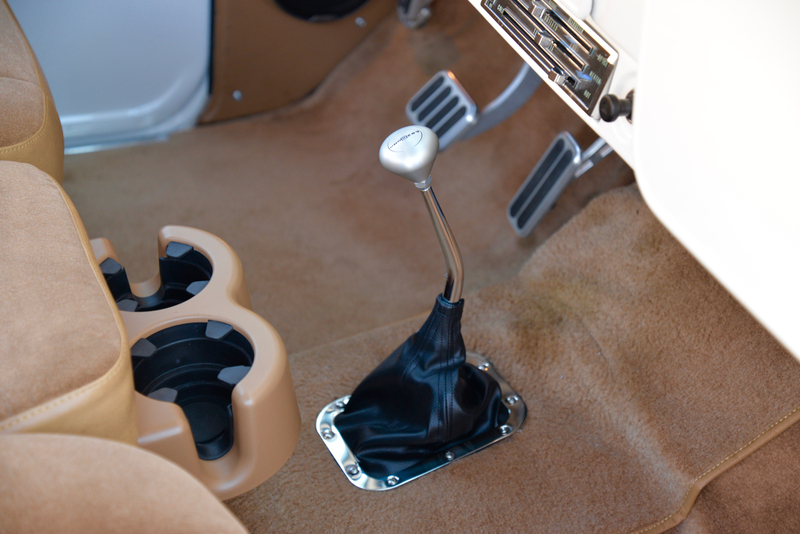 Overall suspension design came from the 1973-87 Silverado. 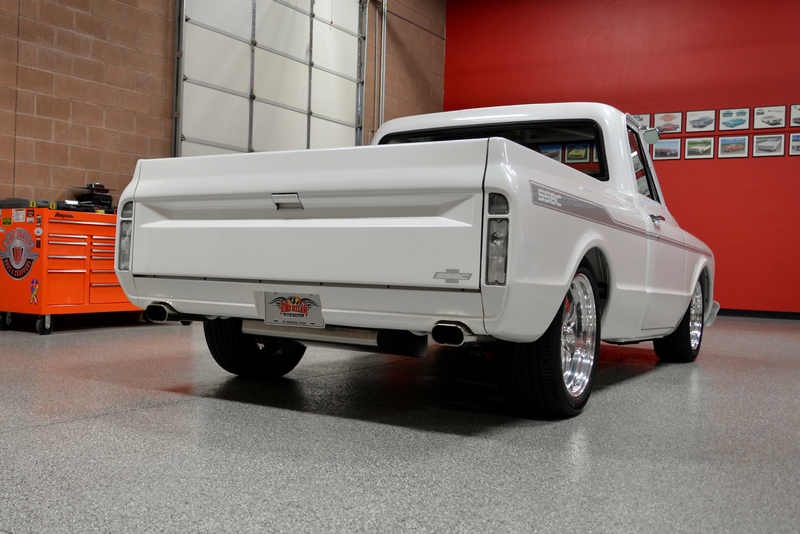 Up front, 2-inch drop spindles along w/ Eaton springs keep the nose low, while out back an over/under spring swap and reversed rear leaf spring lowered the rear 5.5”. 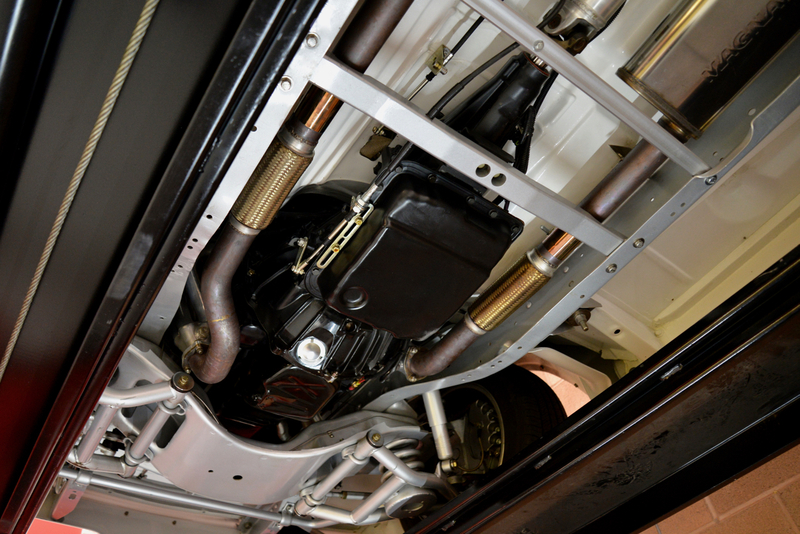 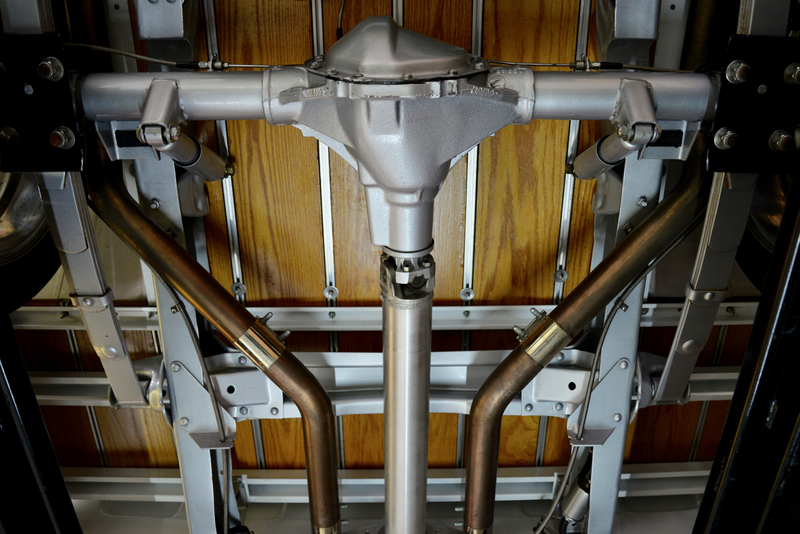 The leaf springs are also from Eaton, while the front and rear sway bars are from Hotchkis, which make cornering a dream. 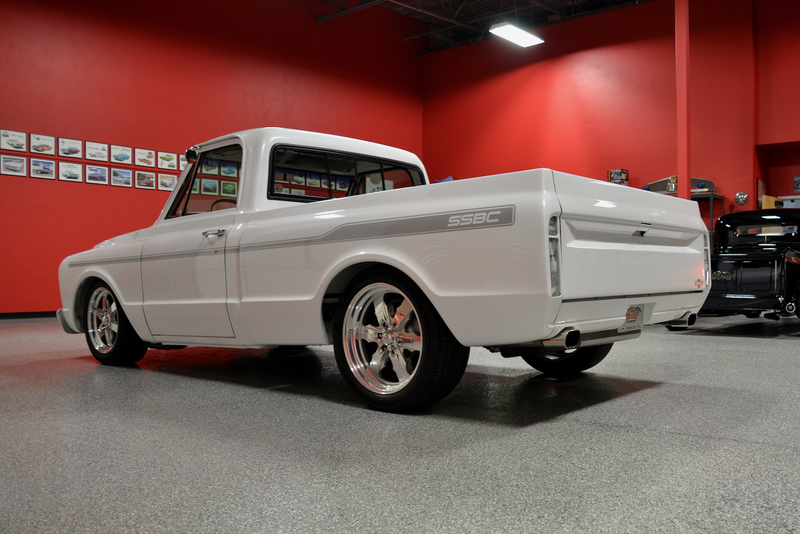 As far as the brakes go, Mike chose his SSBC 14” Tri-power disc brakes for both front & rear. 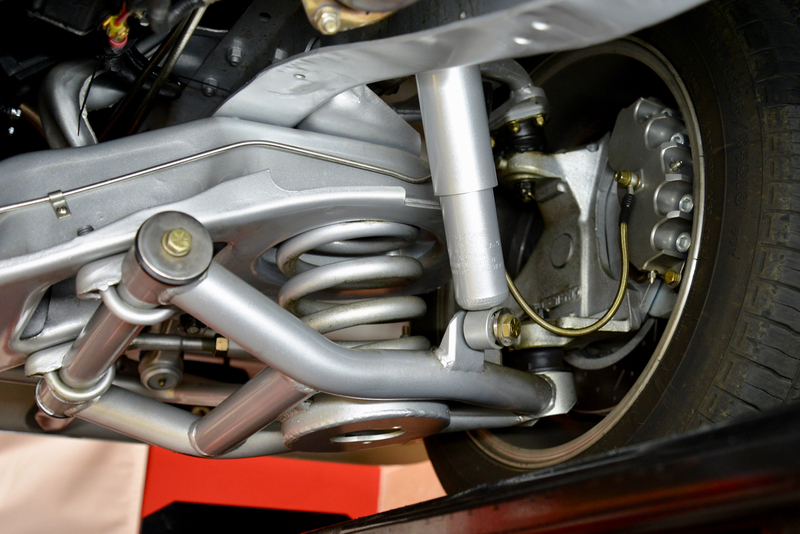 The three-piston brakes are state of the art, and interestingly enough, the center rear piston acts as the emergency brake on the rear calipers. 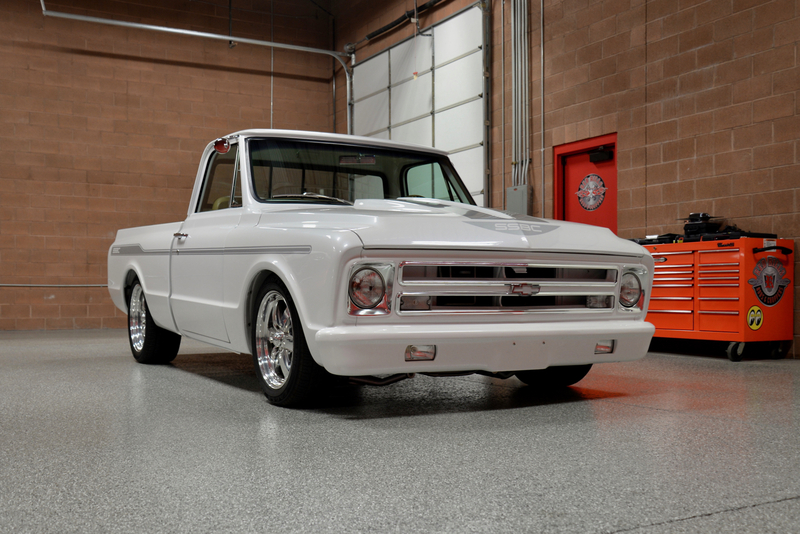 Pretty trick! 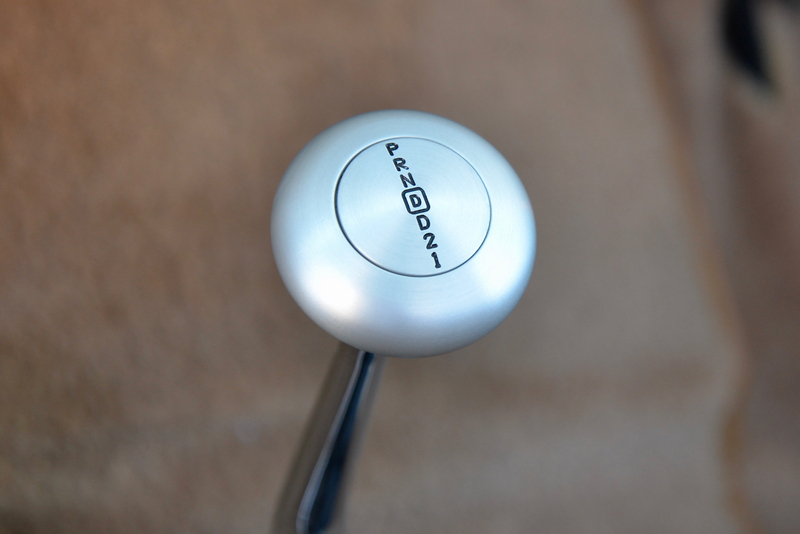 The calipers are powder-coated silver, which looks just right. 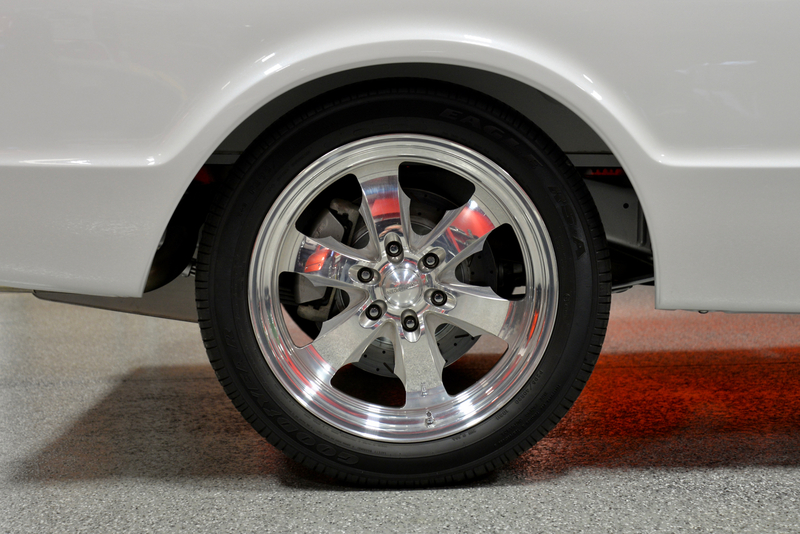 The rotors are SSBC’s own 14” Heavy-Duty Turbo Slot rotors for maximum cooling & stopping power. 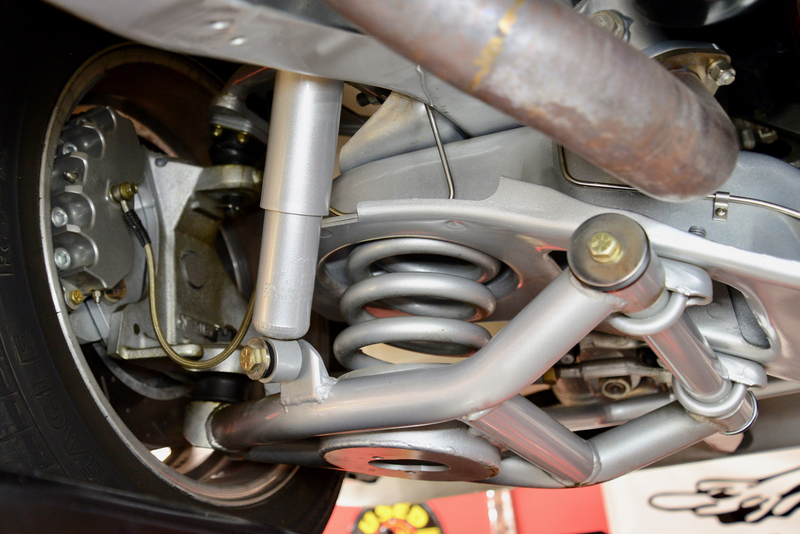 All brake lines are stainless steel, as is every piece of hardware on this build. 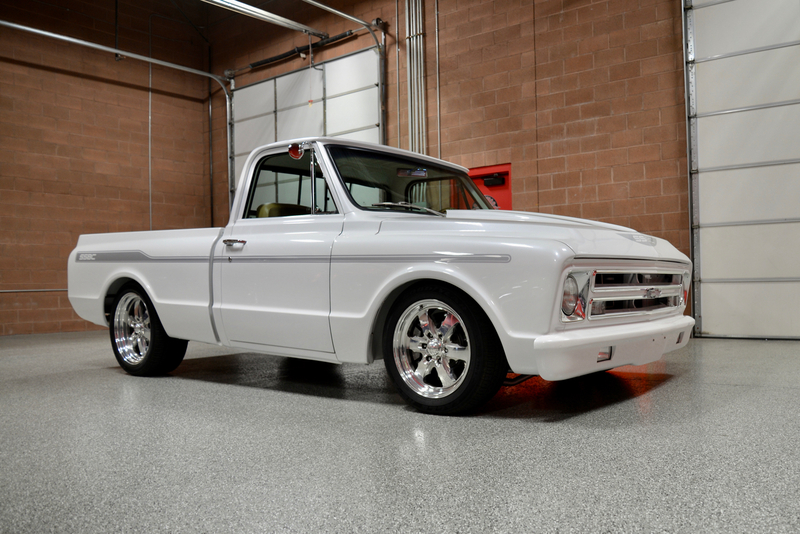 She sits on 18” six-spoke Centerline wheels wrapped w/ Goodyear Eagle GSA radial tires (225/55/18 up front, 295/40/20 in the rear). 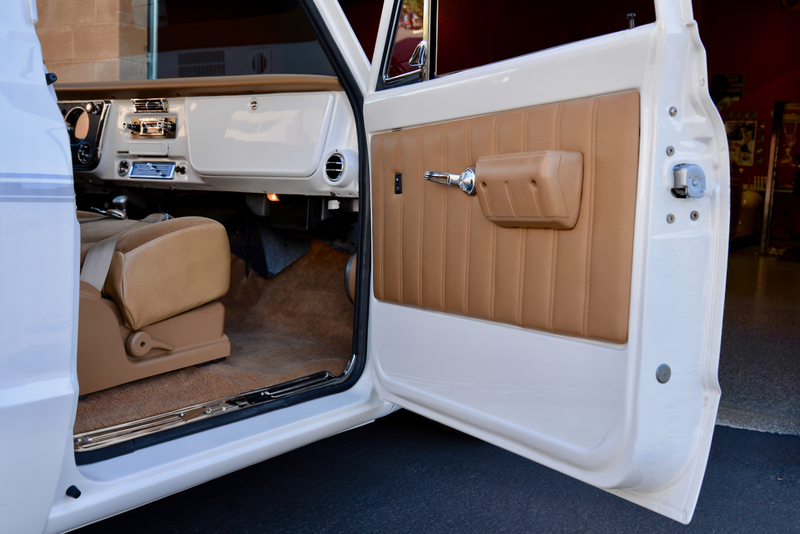 The selection of the 225/55/18 up front allows lock-to-lock turning w/ no fender rub whatsoever. 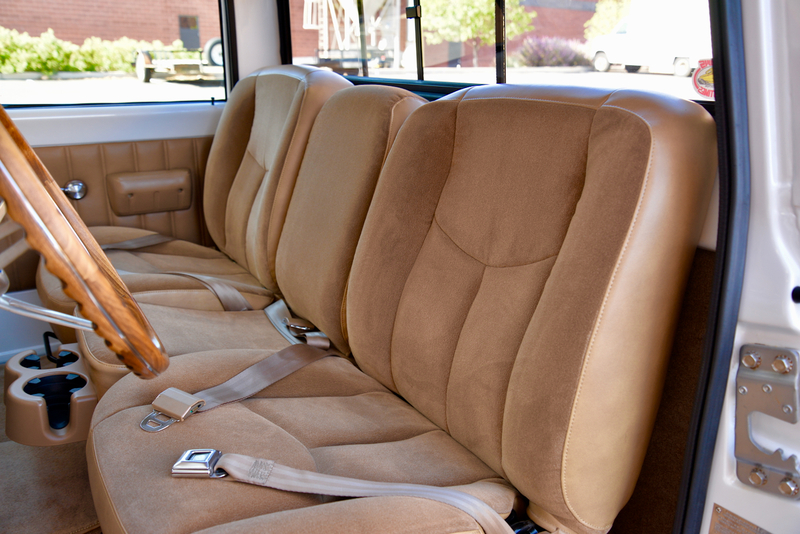 For the interior, Mike wanted to make some room, so he started by relocating the gas tank under the bed. 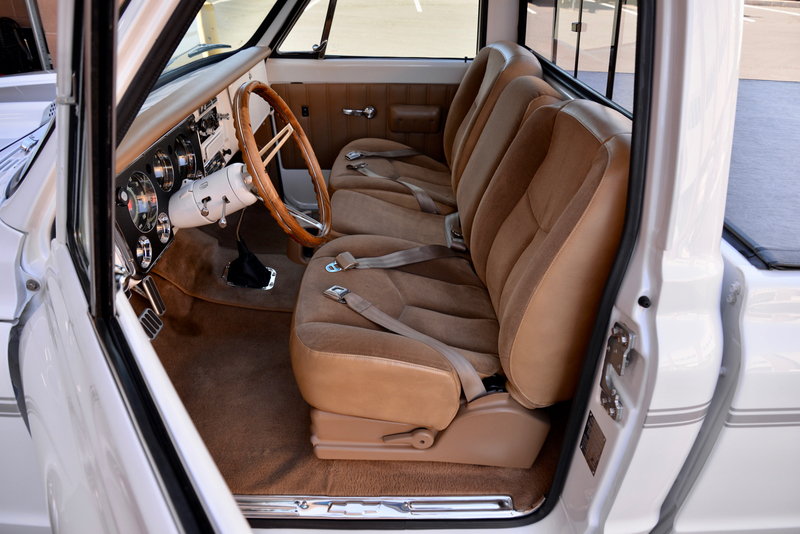 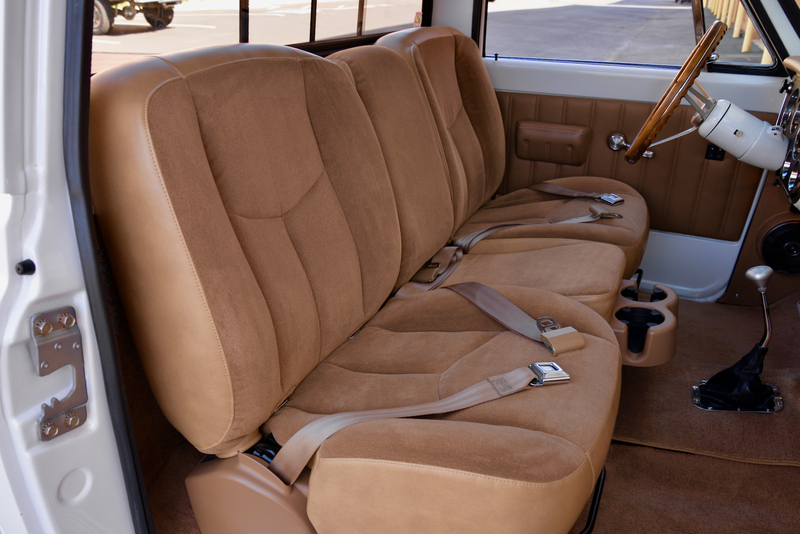 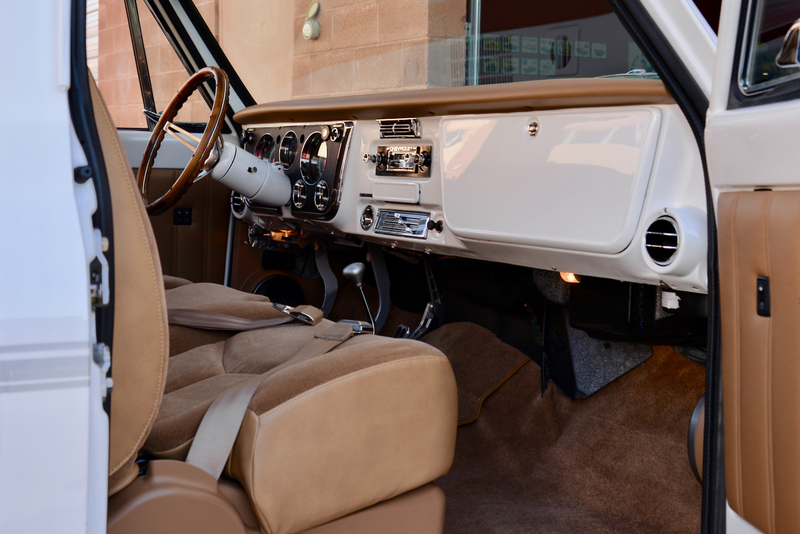 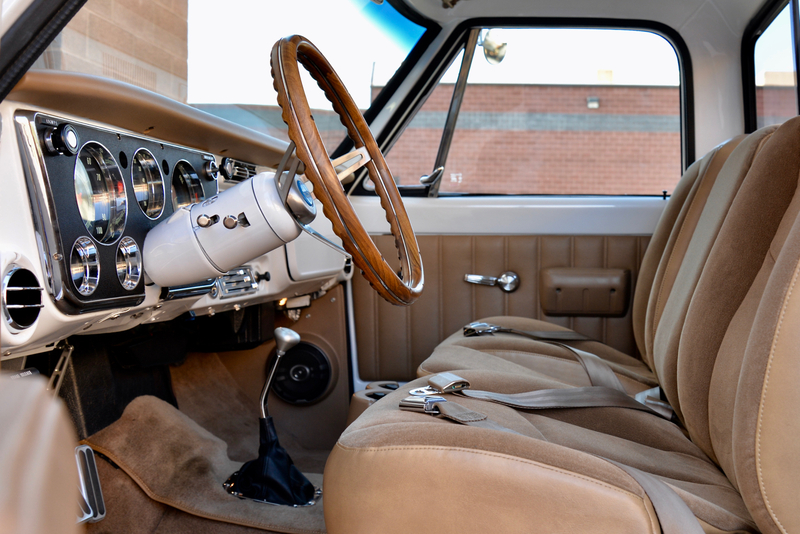 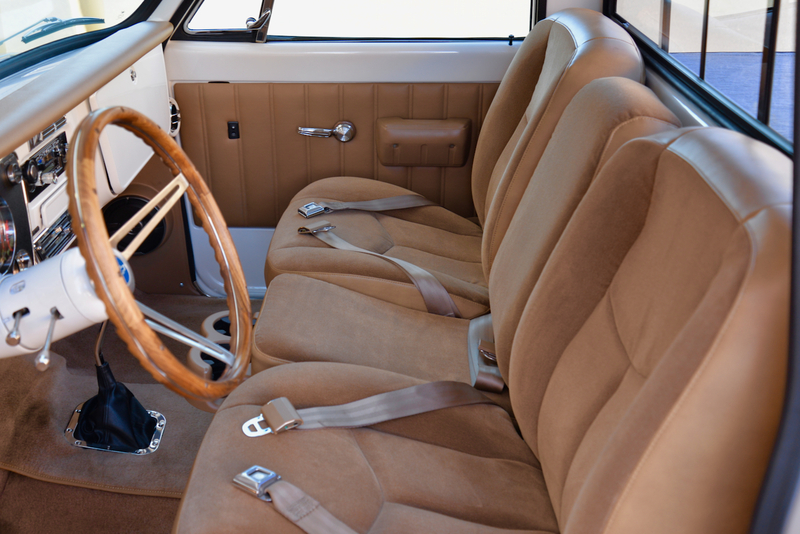 He then obtained a 2004 model Chevy truck bench seat, removed the corner shoulder harnesses, and then had the seat reupholstered in a buff-colored trim, which was actually Mike’s wife’s idea, as she made the case for the monochromatic look as far as the soft surfaces were concerned. 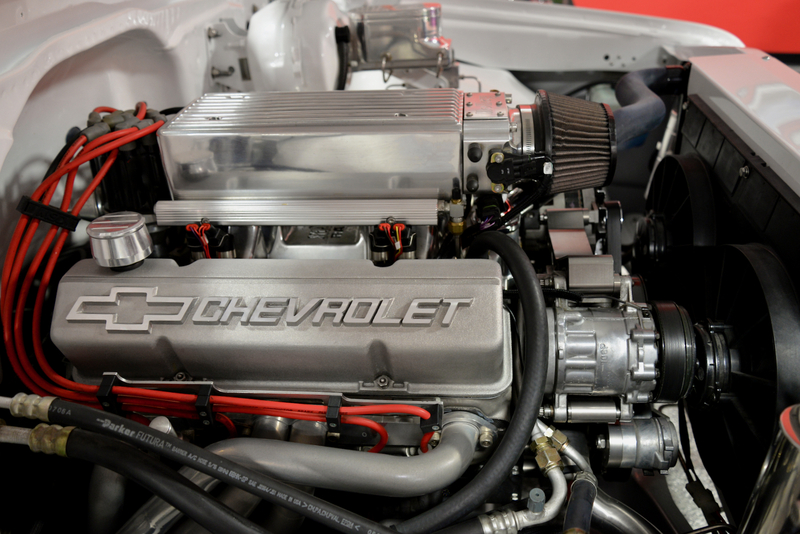 She was 100% right! 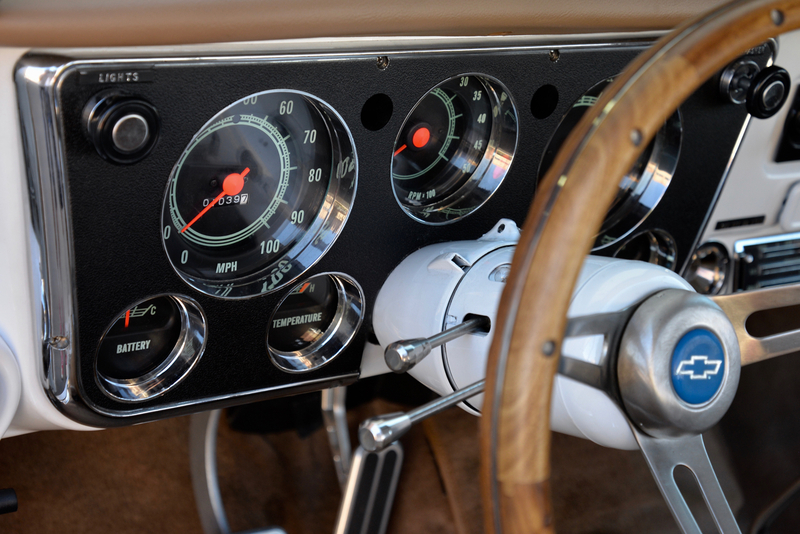 Classic Industries supplied a deluxe package of gauges w/ full instrumentation to keep track of the vitals, and all of the wiring was modernized for safety. 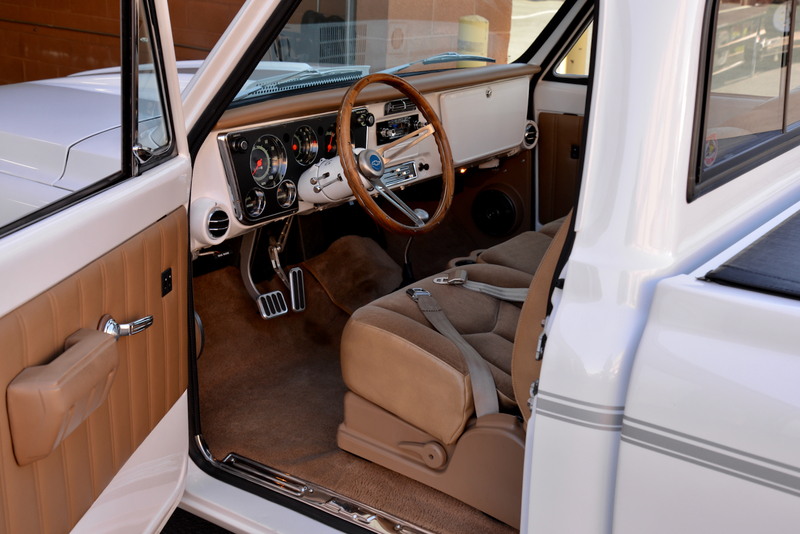 Other upgrades to the interior include a Flaming River steering column, teakwood steering wheel by Classic Industries, Lokar 10” shifter, Lokar pedals & cables, Vintage Air Conditioning & Heat, an audio upgrade from Vintage Audio that includes kick-panel mounted Pioneer coaxial speakers, (2) Kenwood 10" Subwoofers mounted behind the seat, w/ Painless wiring throughout. 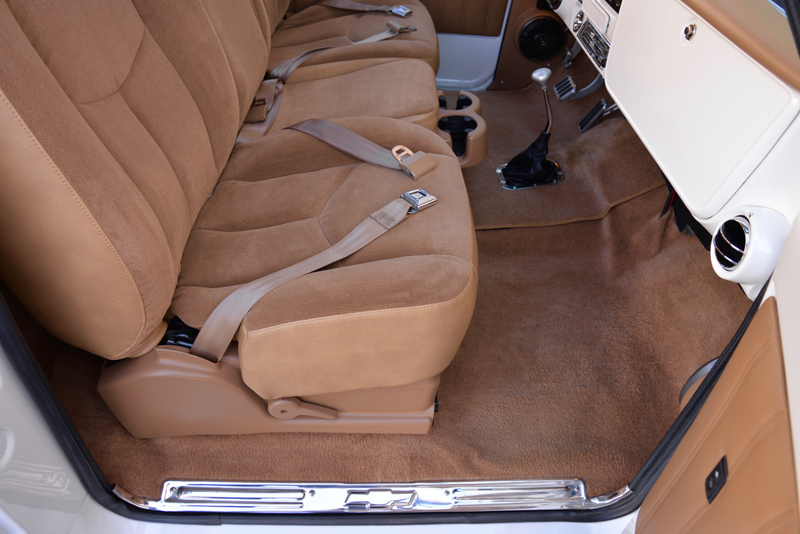 Auto Custom Carpet supplied the full carpeting, and Trim Parts had all the remaining goodies that Mike needed to finish off the cockpit. 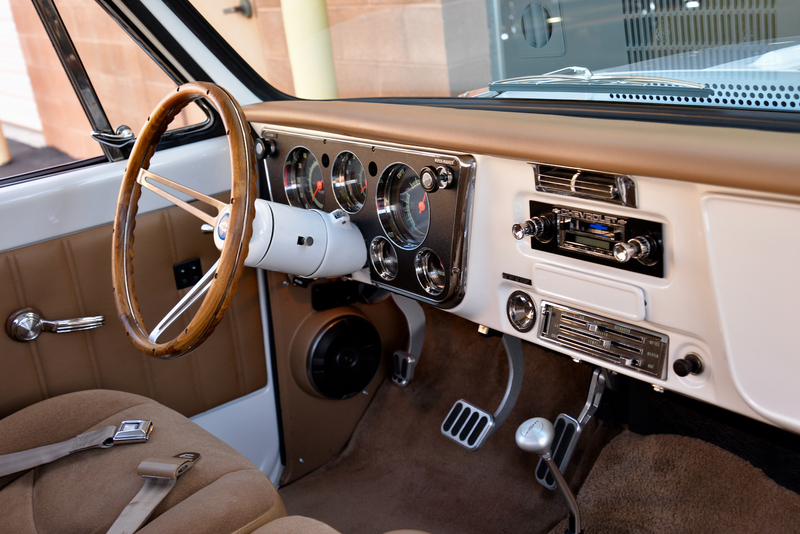 All of the gauges, lights, accessories, etc. 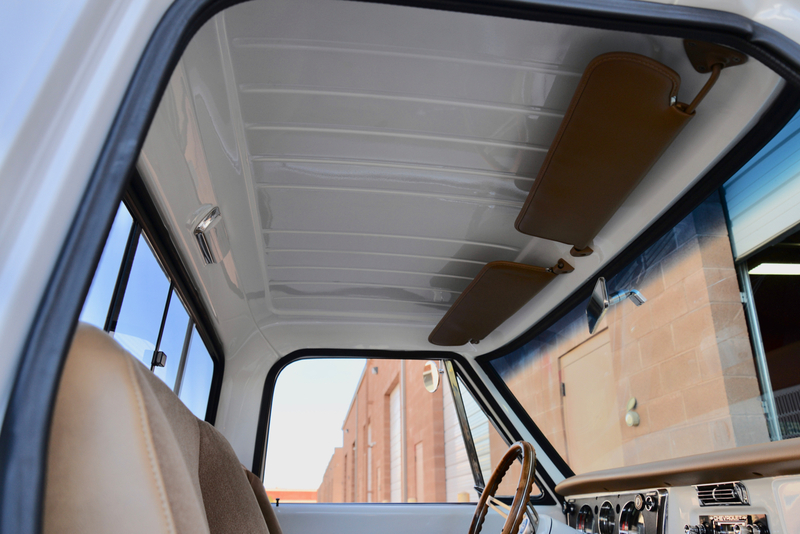 work perfectly and the Vintage AC blows ice-cold! 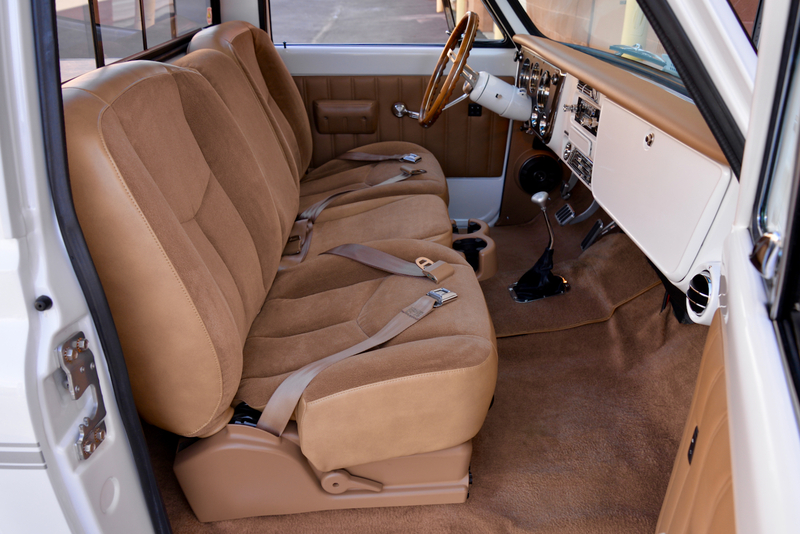 The interior is extremely comfortable and highly functional in every way. 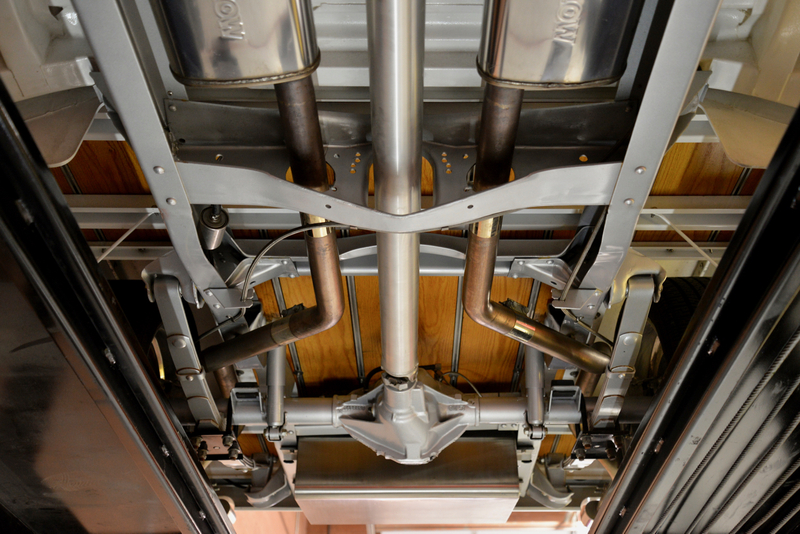 Now, let’s get to the heart of this incredible truck, shall we? 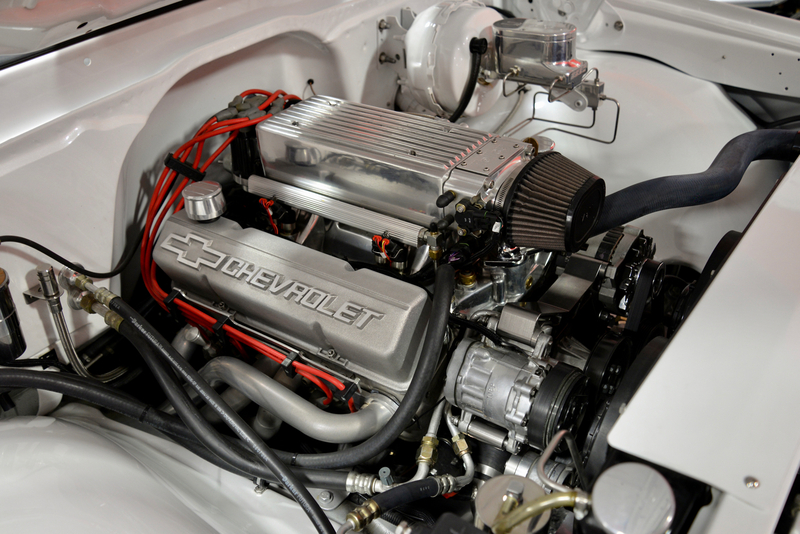 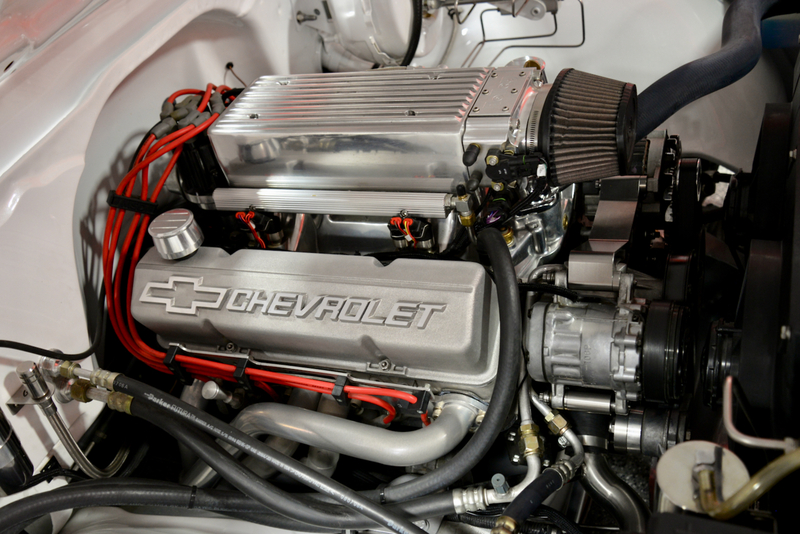 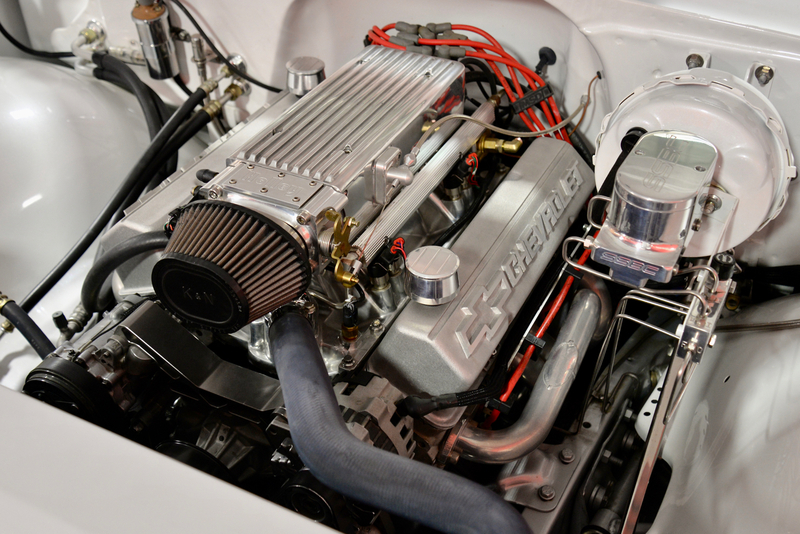 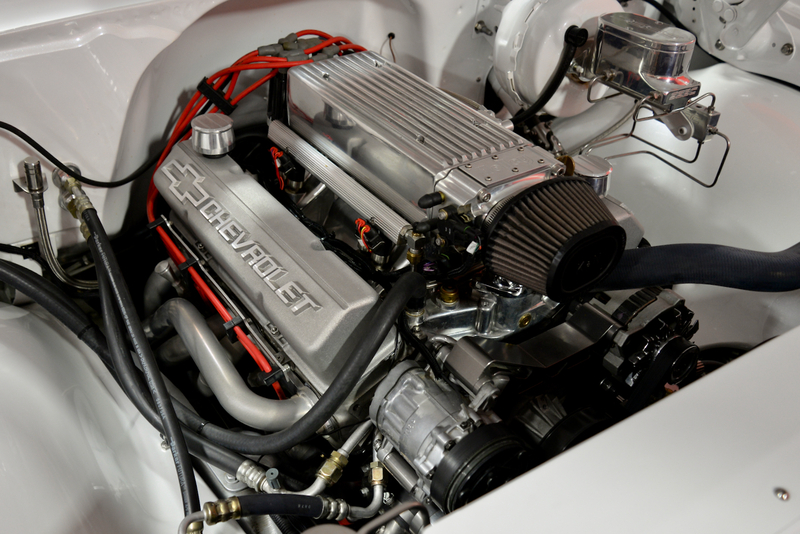 Inside the beautifully detailed engine bay resides a new GM ZZ383 Factory Crate Stroker Motor from GM Performance Parts rated at 475 hp, dressed in licensed GM Performance valve covers w/ Chevrolet logo, topped w/ a Holley Pro-Jection Fuel-Injection system. 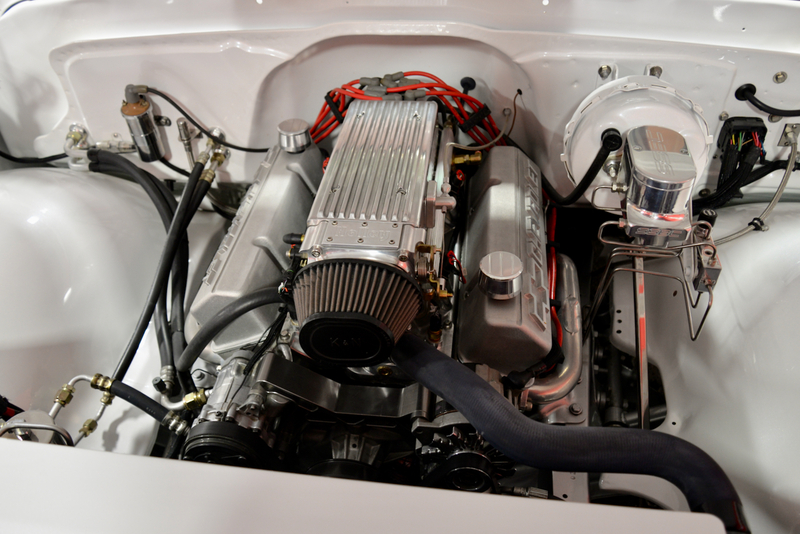 Adding the MSD ignition boosted power to 500hp. 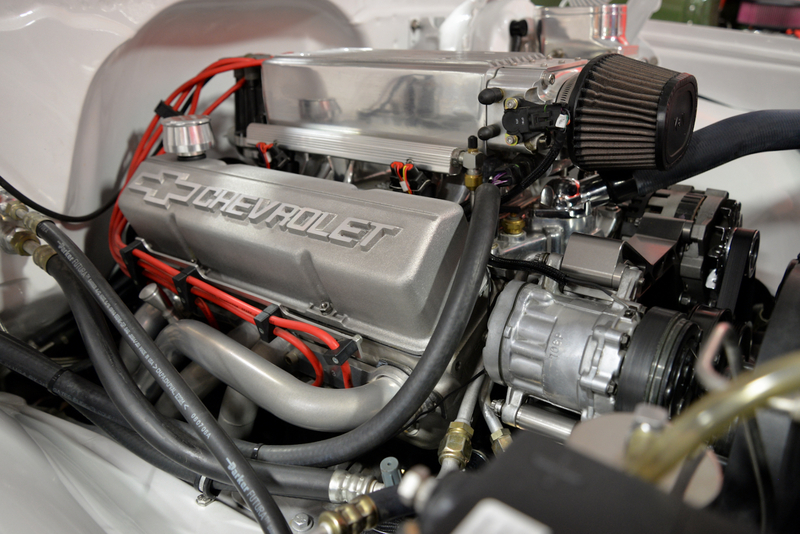 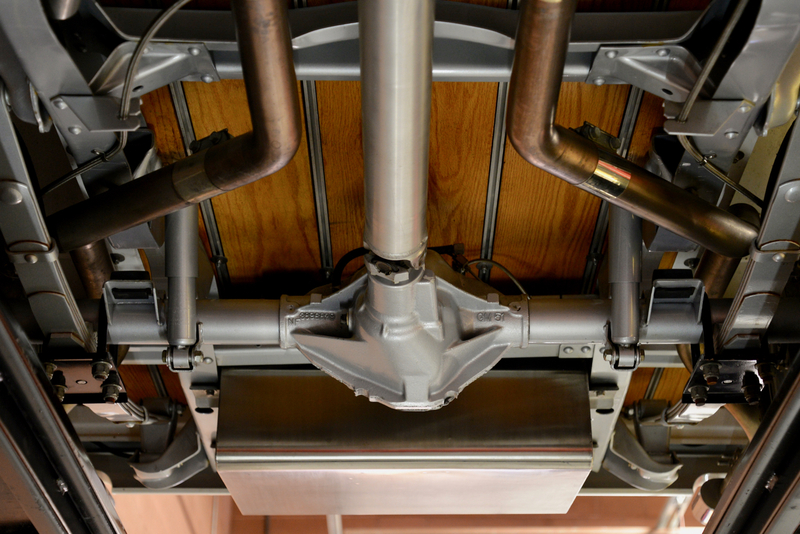 These are excellent power-plants w/ tons of power & torque. 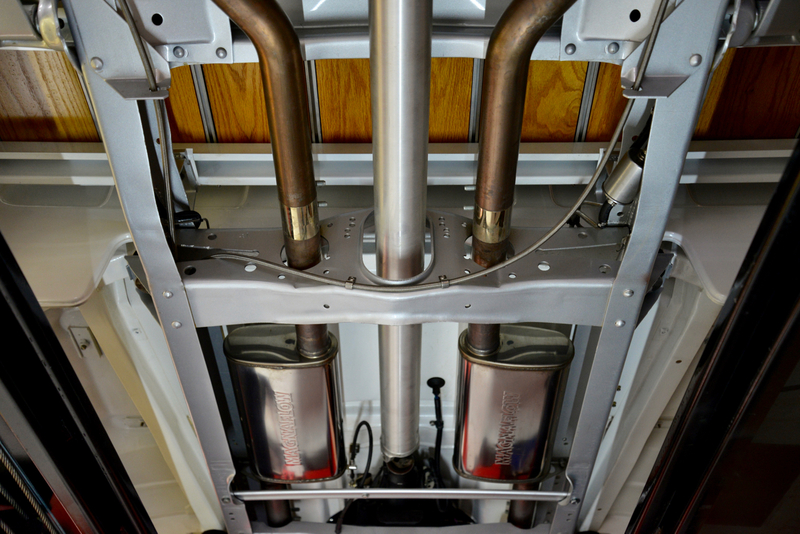 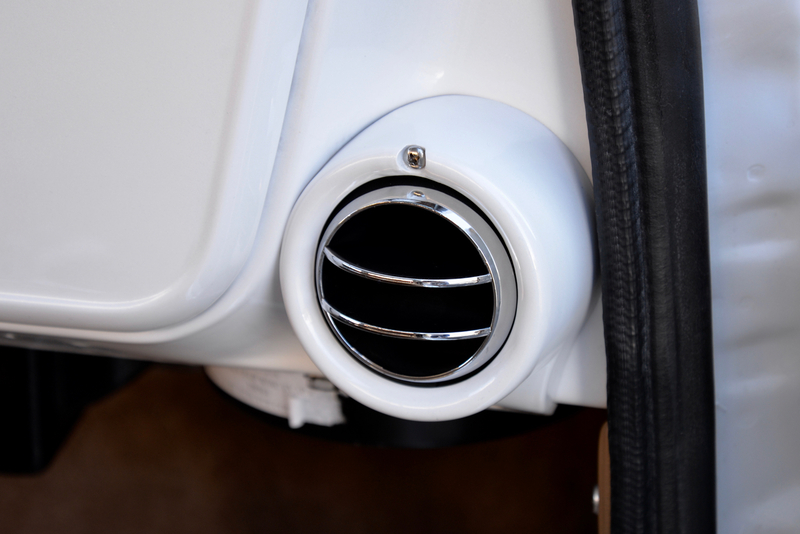 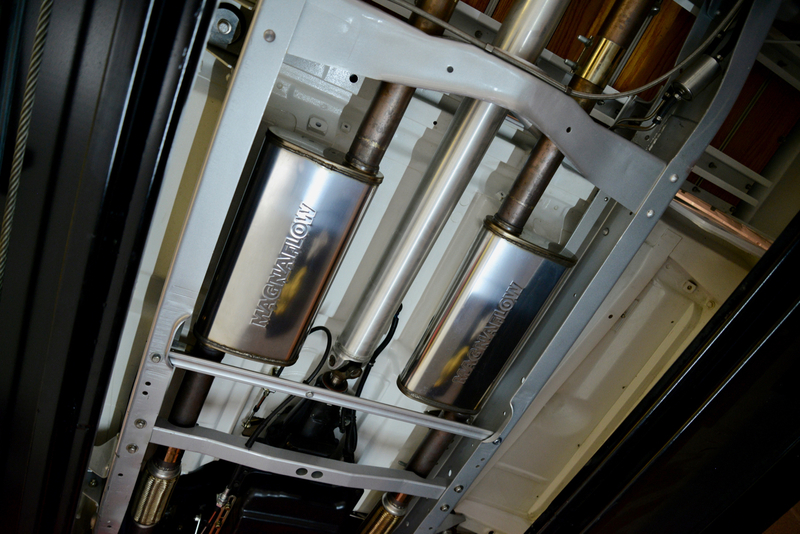 Spent gasses are removed by a set of JBA headers feeding a custom stainless-steel MagnaFlow system, which sounds absolutely awesome! 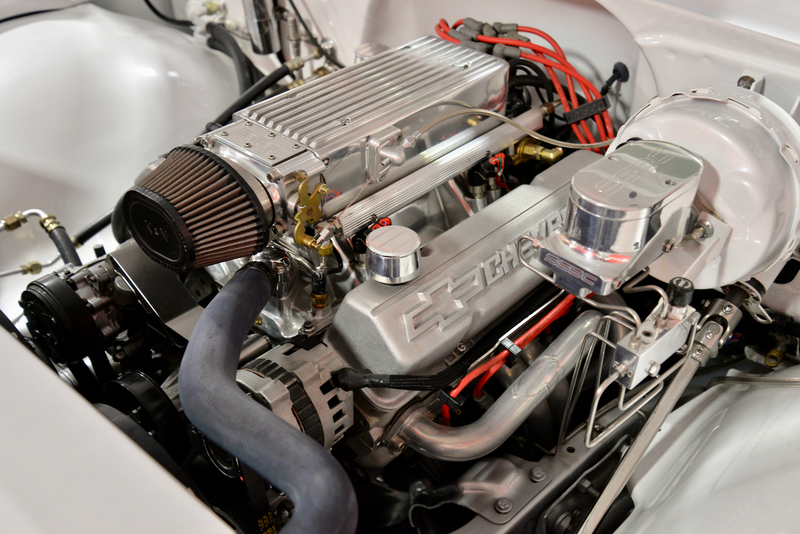 An aluminum Be Cool radiator w/ a set of 15" Spal fans keeps her running nice & cool even in hot summer weather. 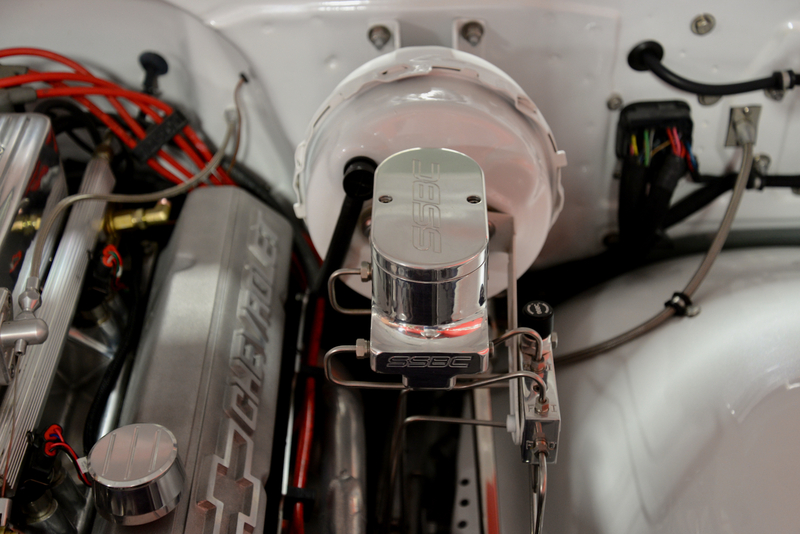 The original brake-booster was reused & painted body color, while the master cylinder is an SBBC billet master carved out of a solid chunk of billet aluminum w/ 1 1/8” bore. 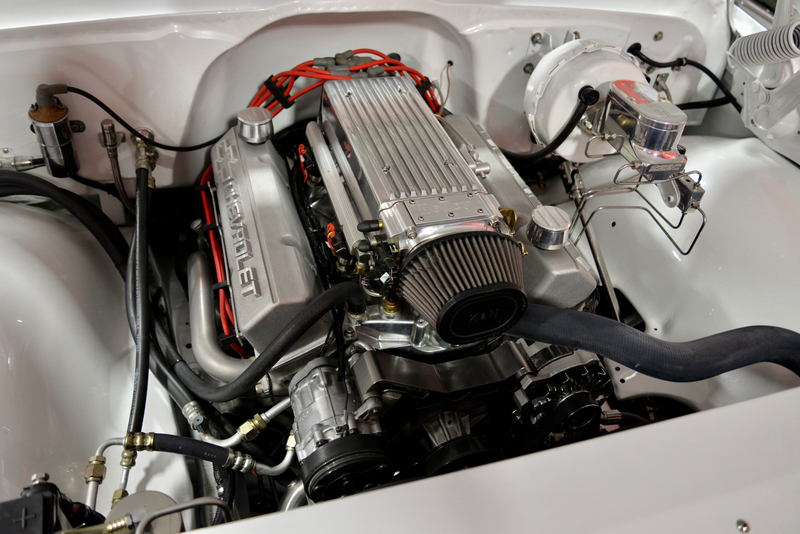 The 383 Stroker Motor is linked to a custom built 4L60E automatic transmission by Bowler Transmissions, linked to a custom aluminum driveshaft from Denny’s Driveshaft, which feeds power to a Detroit Truetrac 12-bolt rear-end w/ 3.08 gears. 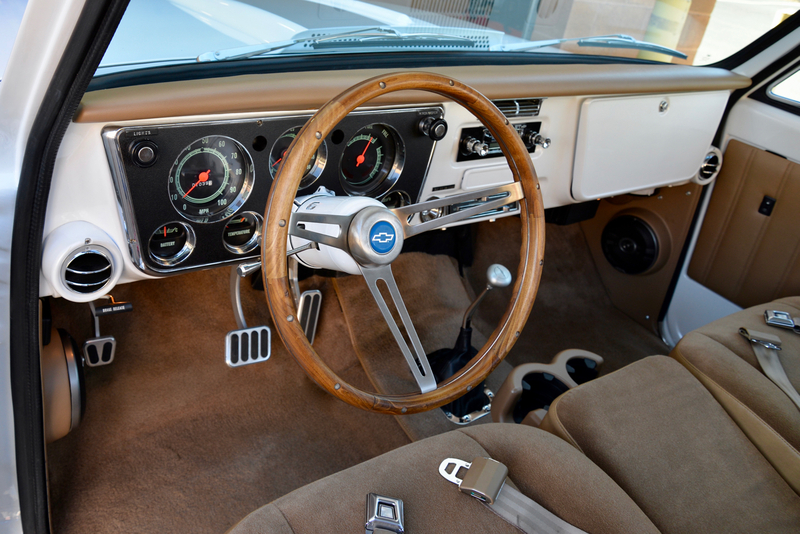 She fires up instantly, settling into a perfect smooth idle, and she runs, drives & performs flawlessly in every way! 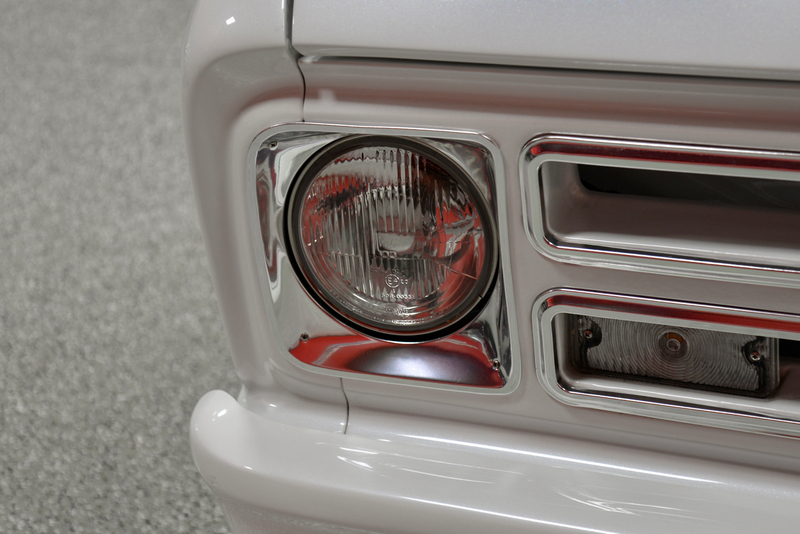 I have had the pleasure of driving hundreds of classic trucks over the last 20 years, and I can safely say that this is the tightest, most responsive pickup that I have ever experienced. 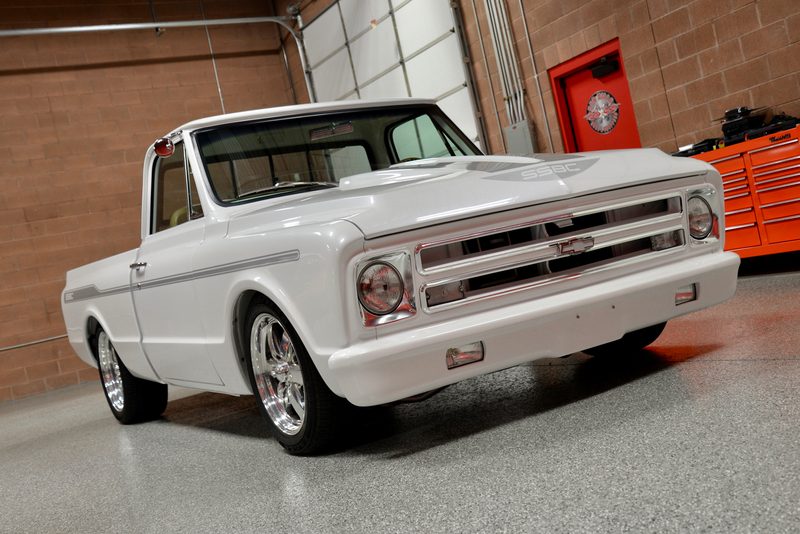 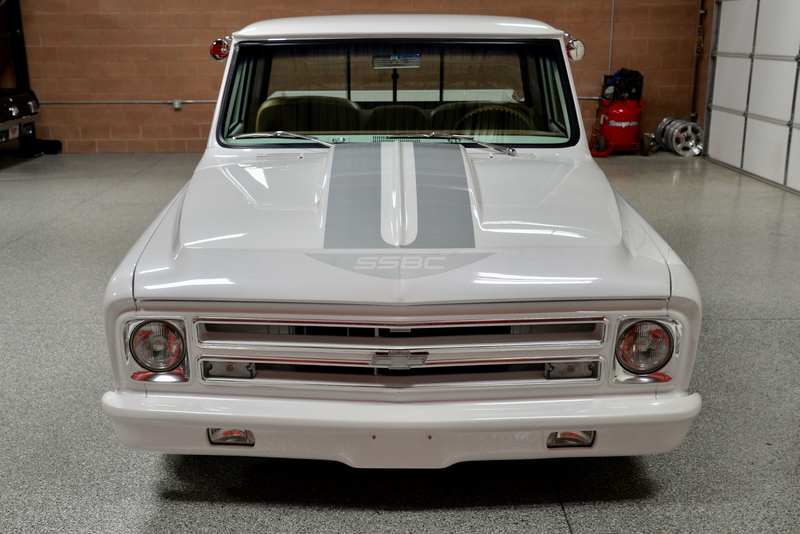 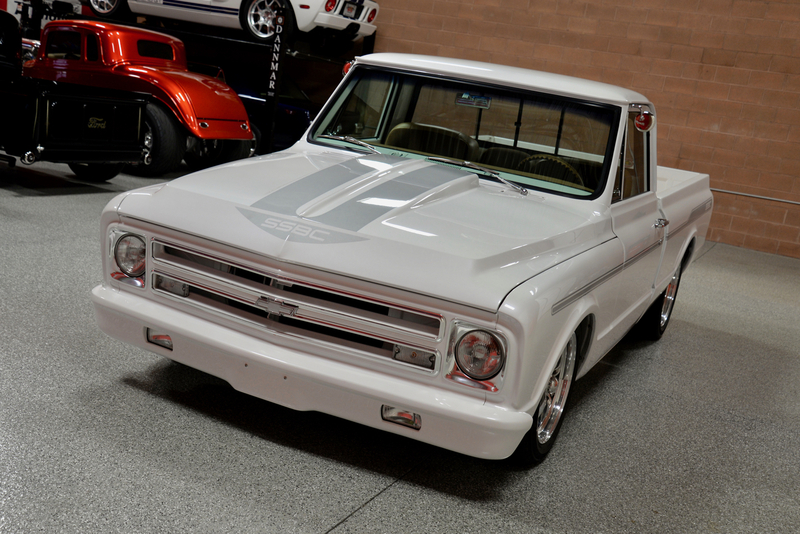 This amazing 1970 Chevrolet C10 Custom Pickup is now sitting on our showroom floor here @ ‘Red Hills Rods & Classics’ in Saint George, Utah, w/ only 1,213 miles since the completion of the build in 2015. 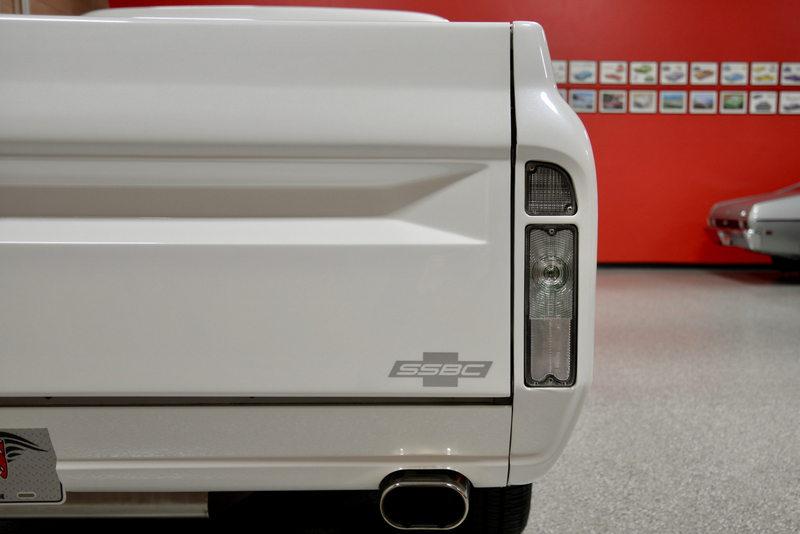 This is a show-winning super-truck in every respect, and it drives & performs just as good as it looks. 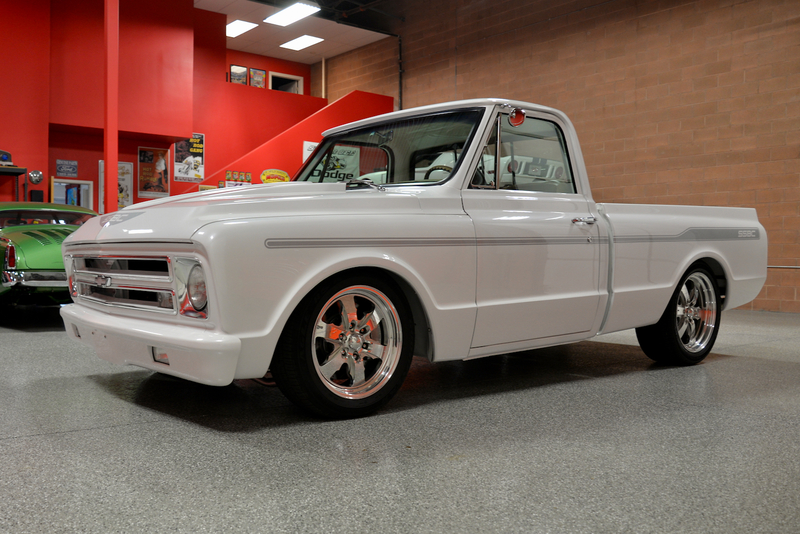 If you have been searching for a special pickup that will separate you from all of the others out there, you will not find a finer more amazing example anywhere @ any price, period!